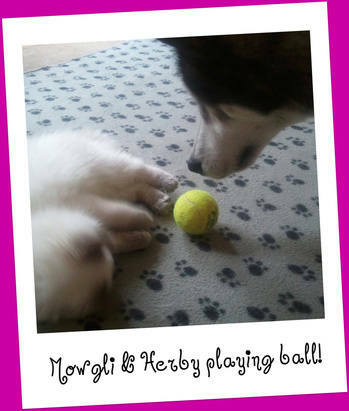 We have so many more Testimonials and Pics!.. Will update soon. 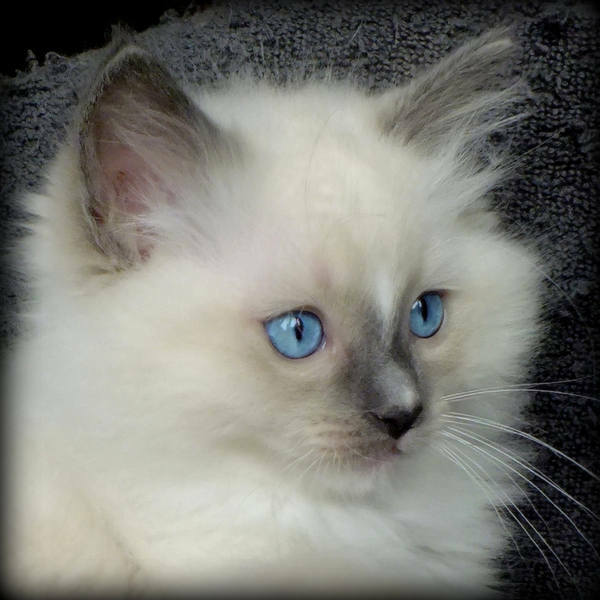 A blue colourpoint mitted with blaze. Well i am home with my adopted mum & dad who seem to love me as much as you do! Thank you for loving me I will never forget you and my family but think I will have lots of fun here. I already met my big sister and put her in her place, she ran away from me! I've eaten and used the litter tray and had a crazy half hour running around but I'm ready for a nap now! Thank you Jo, he is wonderful! Thanks for your mail. Zig's has settled in so well it's unbelievable! He is so confident, he has his play time running around Chasing various toys we picked up from jolly's on the way home & those you kindly gave us. I will go back and look for the game You mentioned. He slept on me for about 5 hrs last night but had us up at 6.50am! He is eating and used the tray, he doesn't Seem to drink the cat milk just yet, I gave him some wet food so not too worried at the mo. Did you say he had the frontline treatment? We need to do boudi this week but don't want to overdose Ziggy as so little, can u let me Know please? I will send you a video of him in the car,when he was happy. we had to put him in the basket as he was quite scared and tried climbing Over the seats which would have been too dangerous on the M1, but he soon went to sleep and was happy, we were home within 2hrs. Thanks again Jo, we adore him. Will send pics etc soon. 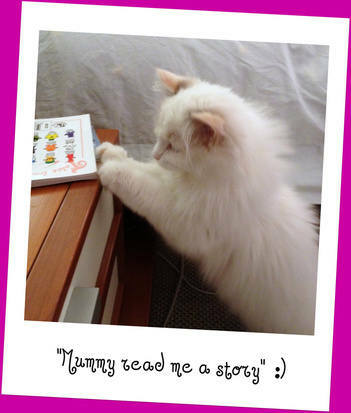 He is so sweet although Joe is not too keen about cats on the table but even he melted when he saw the picture! Zigg's is so dismayed that boudi won't play! She hisses when he gets too close but he keeps going back for more. When ever I open the back door boudi makes a dash out to get some peace! There was a breakthrough Joe & I witnessed earlier, little one was munching & boudi came in, walked straight over to him, touched noses for a few seconds, it was so sweet but then swiped him but not too hard! Pretty good for only 5 days, took her 3 weeks with Ozzie. her breeds but is so delighted to find they are. We think it also has a lot to do with your loving home environment & handling. Sending another photo I posted on face book called 'yummy', it's lovely! Just wanted to say a BIG thank you again for allowing us the privilege of adoption one of your special little ones! 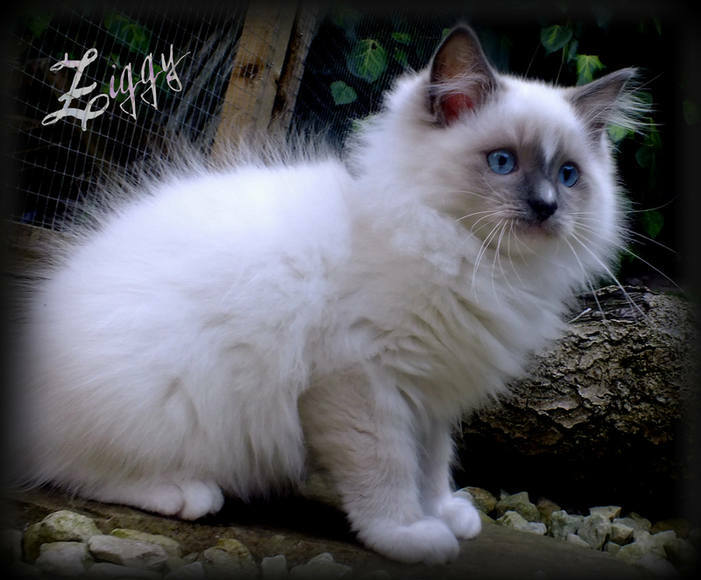 Ziggy is utterly amazing, we love him soooo much!! He cried for 20mins on the journey home but soon settled as you can see in the video I sent you! I was so sad to take him away from his brothers and sisters, it broke my heart to see you in tears saying goodbye to him. You obviously have such a bond with each and everyone of your babies, I don't think I could do your job, I would have a house full of kitty's! Once home he strutted around like he had always been here. Boudi our other puss wasn't too pleased when he ran straight at her. 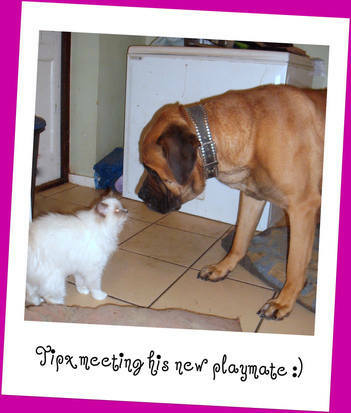 Had to remind him of the rules, she is top cat and will love him eventually but best to avoid her for while. 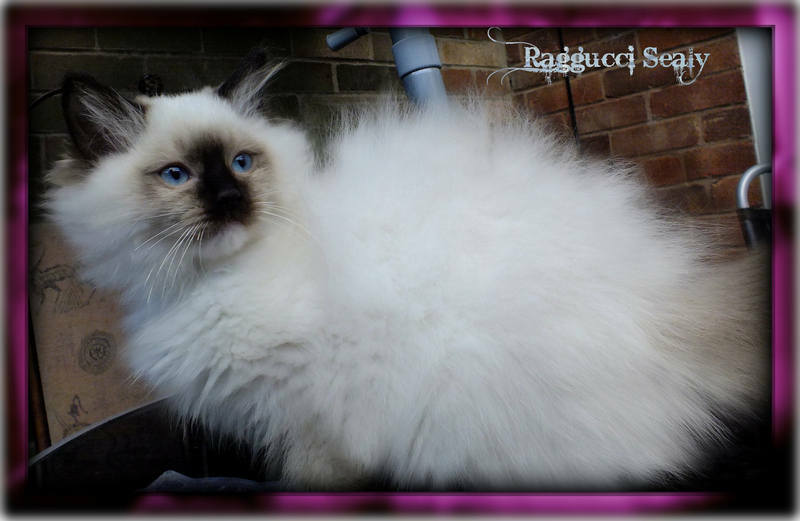 We knew raggies were special but OMG he give us so much love and attention equally we can't believe it. I finally have my lap cat. He sleeps on the bed, beside the bed, on my head, under my chin infact any where that he can snuggle. Within 2 hours he found the one place we forgot to block well enough.....the fire place. He came out black.....should have called him sooty! We were distraught but managed to clean him up. He sat on joes lap happily while Joe brushed it out. We feel the way you and jordan have loved and reared them has an awful lot to do with his adorable nature, you truly are special and once again thank you for bringing him into our lives. 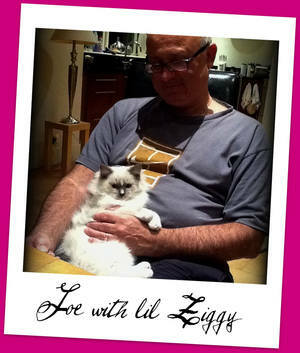 As you know it was only the tragic passing of our darling chinchilla puss, Ozzie 8 weeks ago that we even have Ziggy. We are still distraught, he was only 5yrs old and we thought healthy but something bust in his chest ( cancer they think,) he was gone within 2 hours of falling ill. 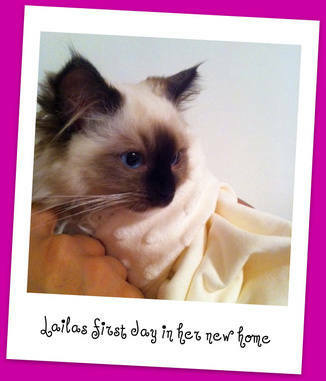 It was a terrible shock and the house felt so empty without our boy, that is why we decided to get a rag doll. 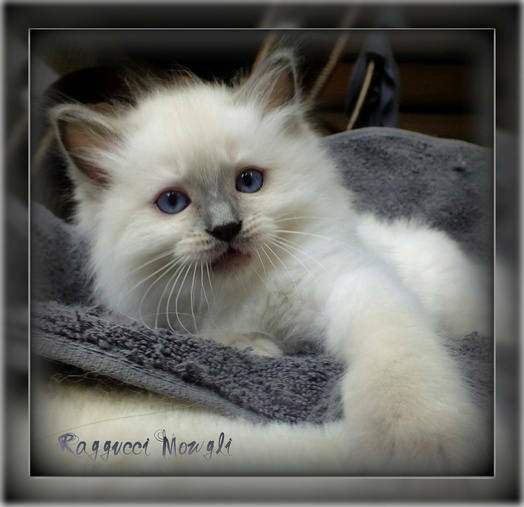 I wanted a raggi when we found Ozzie but like Ziggy he came into our lives unexpectedly and was adored, be it for only a short time. It's almost like Ozzie has sent Ziggy to us to heal the pain we feel. 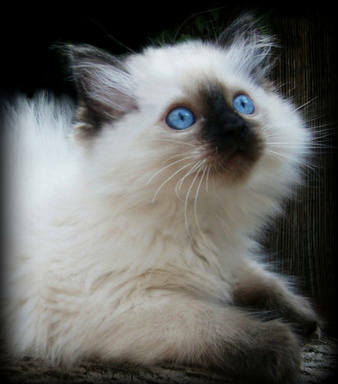 Ziggy gives us so much attention and those blue eyes melt our hearts when he looks into ours. 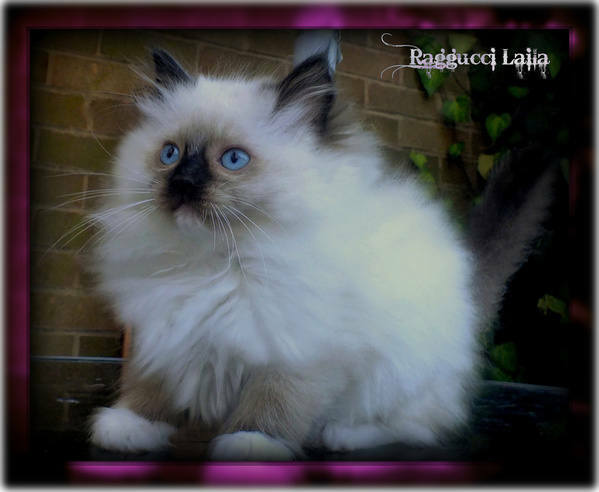 He is everything and more than we ever expected Jo, we are total Ragdoll fans now! 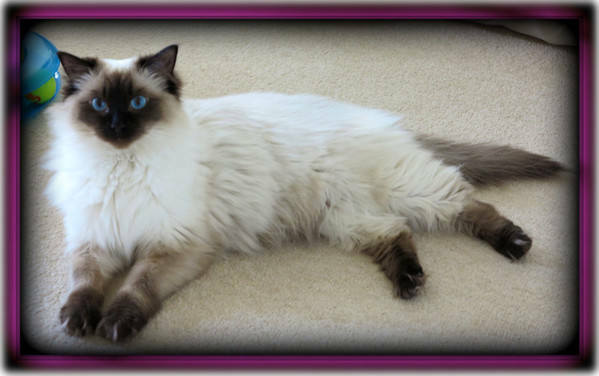 My mother in law can't stop talking about your lovely cats & said had she been younger, she would have loved to have one too. She lost her "suzi" puss about 5yrs ago and didn't get another as she also spends a lot of time in Italy, 5-6 weeks in the summer and 2 weeks in October. 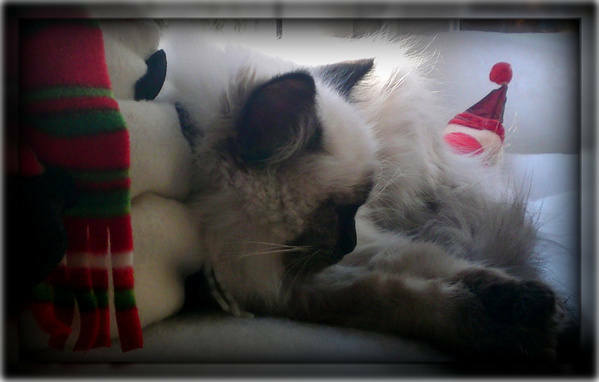 We used to go daily to feed her and she was fine but know that wouldn't be the case with a rag doll, the soppy devils! een great buddies. BOUDICA is becoming more accepting, only a hiss or two when he comes too close. 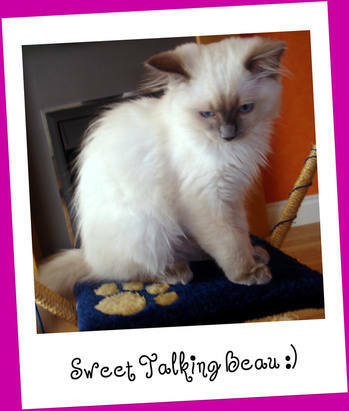 Prepare yourselves for many more photo's and videos, we can't resist filming him as such a lovely handsome little man. Is the White bits above and on his nose called a 'Blaze?' read about it somewhere. Glad you like the parrot video, how cute is he? Took a lovely pic of him on me in bed, think I sent it to you? It's a yellow tinge to is as taken with my iPad and they have no flash but you can still see how stunning zig's is! Noticed you sometime take the cats when owners are on holiday? Worried about next may when we go away for a week as taking joes mum as she would have had him! Do not want to put him a cattery and although neighbours come in twice a day to feed boudi I think he would be very distressed at being alone all day. Would it be difficult if you had him for us with him then being away from the other kitties for 10 months? Hope I'm not being cheeky in asking you but I know he would be so safe & loved by you both! It's a long way off of course. He was sleeping by the bed but just now lept up for a snuggle. It's like he knows I need a lot of love and affection after loosing our darling boy, Ozzie. I tell him all about his big brother who is his gardian angel all the time. It's bitter sweet at the moment, just wish Ozzie was here to play with him but had we not lost Him, we would never have met Ziggy. Very sad but very happy....you know what I mean! Thanks for your reply. Hope alls well with you and yours? 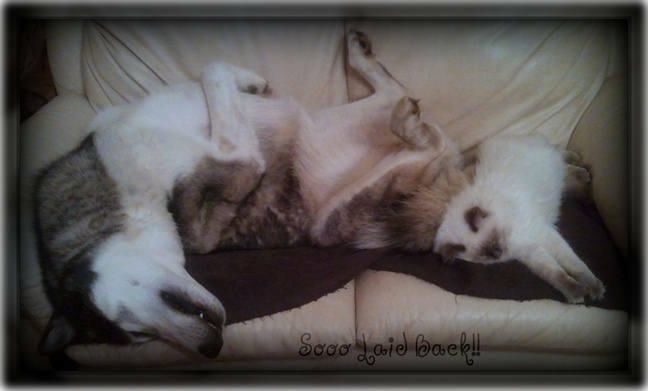 Yes zigs is very happy with us we think, it's always amazing me how he settled so quickly in his new home. He seems to be loving Joe at the moment and sits under his desk all day! He also has to have some contact with him by touching his foot to say 'I'm here!' even when Joe moves his foot he moves also, it's so sweet! As i am in bed a lot at the mo cos of illness, I have some crunchies and water in the bedroom for Ziggy, it's so sweet when he wants feeding , he goes and lays down by the bowls, v funny!! Everyone who sees him, Even delivery men and postman love the zig master as he is so nosy when they knock and greets them at the door. They pick him up and are amazed how soft & cuddly he is. Most hav'nt heard of the breed but are amazed how floppy they are when picked up! Our friends who feed boudi when we are away, couldn't believe it when they met him yesterday. They are used to boudi! It was nice tho for them to see boudi was very relaxed around him, just tapping paws when zigs was teasing! Anyway take care and will send more pics soon. Just to say we can't believe how laid back Ziggy is around the house and will be sending you a video of him lying on the floor and hoovering around him, nothing bothers him, it's so funny! Got some new toys today and one being a lazer toy, he chases if so much he had to take a flop and rest half way thro! Good exercise for indoor cats. 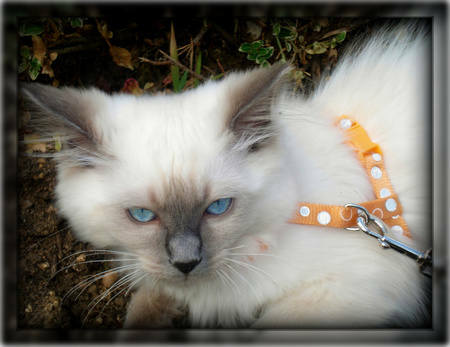 also got a cat harness & lead to try and if he likes it will get one of those jackets. 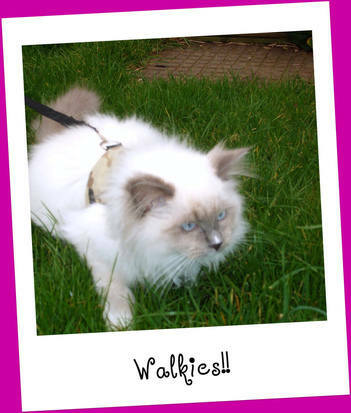 There is funny clip on you tube, called ' this is why people don't walk cats,' I will send u a link, it's so funny! We Have a couple of lovely Bulgarian girls every two weeks to help me with the housework and they are smitten with him, taking videos and sending them home every time they are here. They can't believe how much he has grown everytime they see him. I have to frisk everyone on the way out as they all want to pinch him! Ha ha! Here is a montage of Ziggys little moments. The lazer toy I wanted is due in stock within the week but ordered another type which I ordered but not sure if it's any good but may be ok until the other one arrives, also sending some cat stick treats as an early Xmas pressie for your enormous family! Joe just witnessed Ziggy chasing boudi up the stairs and over the spare room bed etc, just as Ozzie used to do when they were playing! They really are getting closer and both slept on the bed last nice with only a foot or two between them. It was so funny when boudi went on joes chest as she does every every nite for a quick cuddle where Joe gives her a massive pamper, Ziggy didn't like it too much and looked at me as to say....hey I should be getting that not her, his expression was priceless! Just to say I got an email saying parcel is on it's way to you from pet supermarket and should be with you next week. Let me know when u get it incase it goes missing. Also the other laser toy is back in stock, will get that for a Xmas pressie from zigs to his family! He misses them all but asked me to say he is very happy with his new family and that he is slowly bringing around boudi to love him as much as everyone else does! He he! Hope alls well? Ziggy sends his love...the cheeky monkey! Did you see videos of boudi & him playing, also the 1 of Joe teasing him yet, very funny?! 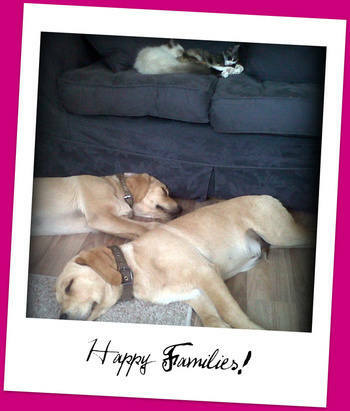 Thank you for your lovely Christmas greeting pics of zigs family, he was delighted as were we! He is embarrassed that he only managed a little red bow and badly at that! Will try later to dress up. Must get a hat for next year, where did you get the costumes they are soooo cute! He continues to hypnotise us every day, can't imagine life without him. Everyone loves him and most of the cab drivers I know adore him, taking photo's of him on their mobiles and saying they have never seen a cat like him in their life! We are amazed how much Boudi loves him, they play all day, it's so funny! His latest trick is he appears on joes chest at 5am just before the alarm goes off, almost saying come on wake up, I want my grub! 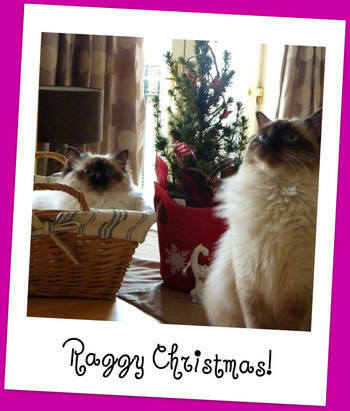 Wishing you a very Raggy Christmas! I miss you and my family but Alison & Joe love me to bits and I am very very spoilt! 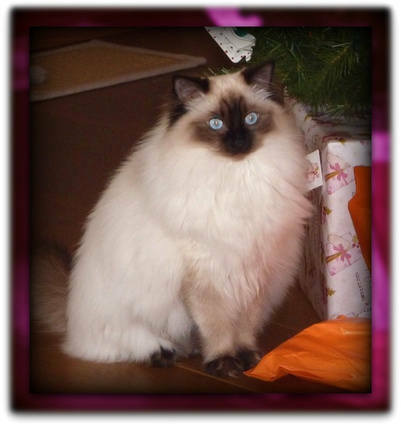 Ziggy's First Christmas...Aged 5 months old. We can collect him at 4pm and say all is well, thank god! Joes been pacing the floor and saying " I miss the little fella so much Ali" even just for a few hours! The staff all love him and weighs 3.6 kg.....bloater!! One guy said "wow what a stunner you have there!" Joe was a very proud father! P.s. Boudi keeps looking for him, it's so cute, never seen that before! And seeing little Raggi's draped over various furniture, but mainly his dad! He said the way he looked at him and came over to Gina, it was like " now that's my boy,,,,look after him"
Lately Joe keeps saying zigs is really beginning to look like him, so your right! I comb him most days, mainly under the chin and he loves it, unlike poor little Ozzie who hated it and really needed it! Not only is he stunning looking, his personality is wonderful and so trusting. He still cries if he can't see us, like when Joe goes down to feed them and comes back up whist they are munching, after 5 mins you hear this pathetic little cry " where are you?" We call him and comes running to us every time bless him. He has these mad little moments where he dives up and down the stairs (3 flights of stairs) into my bedroom bounces off the wall almost, under the bed and out the door again to do the same about 3 times! So funny, I must try to catch it on film. On Monday boudi was on the window sill waiting to come in, when he saw her and took a long run at her and bounced off the glass, now that was priceless! I got the neutering form back today so will post it tomorrow if ok with you. Wanted to check it was completed correctly, so the vet Sent it back to me instead of you. Yes Ziggy is losing a bit of his coat as we notice some fluff around but nothing like ozzie's! Joe has been having massive cuddles in the mornings from Ziggy, not me,after the alarm goes off, in fact he puts it on 30mins earlyJust so he can do so! It starts his day off in a very good mood, thank god! 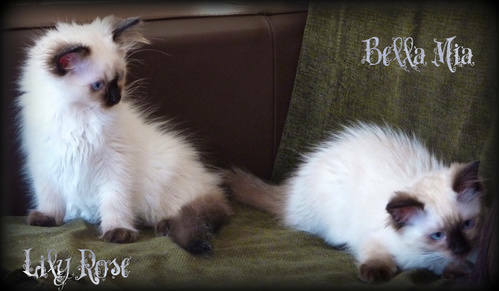 These Two Lil Girls Are Both Seal Colourpoints. You will be pleased to know that the girlies have settled really well; within 30 minutes of arriving home they both had a bit to eat, a drink & used the toilets! The car journey went very well; Bella tried a couple of time to open the gate but then they both settled and actually slept most of the way until we got home. 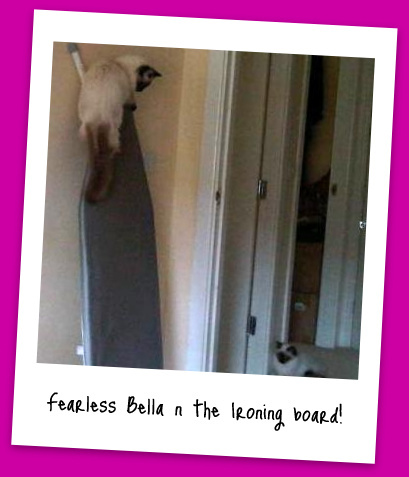 When we got home they explore their new environment; Bella is definitely the bravest, Lily is a bit more cautious. They love playing together for ages especially running after each other around the appartment & "play fighting". They both love the scratching pole with the big paw at the top, they play "who gets to sit on the paw first" and then defend it! ad at the scratching pole! Their first night went without any problems, they both settled very nicely on the big sofa for the night; same last night. Saturday we went to register them at the vet; Caroline our vet/friend absolutely fell in love with them. She said that they are absolutely gorgeous and she also said that all credit goes to you and Pawscha for bringing up those babies so well. 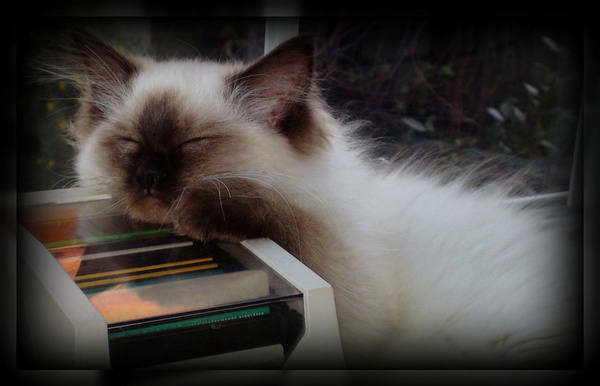 Lily & Bella were totally unfazed and fell asleep on her table! I have a pix on my blackberry but forgot my cable at work so I will send it to you next week. They are very funny they keep calling each other from room to room! 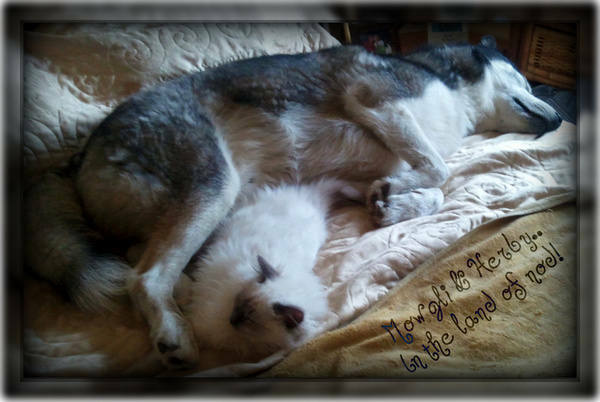 They play all morning & come 8pm but during the afternoon they like their sleep. Poor little Beau is without his sisters now; I can imagine how he & you are missing the three girlies. 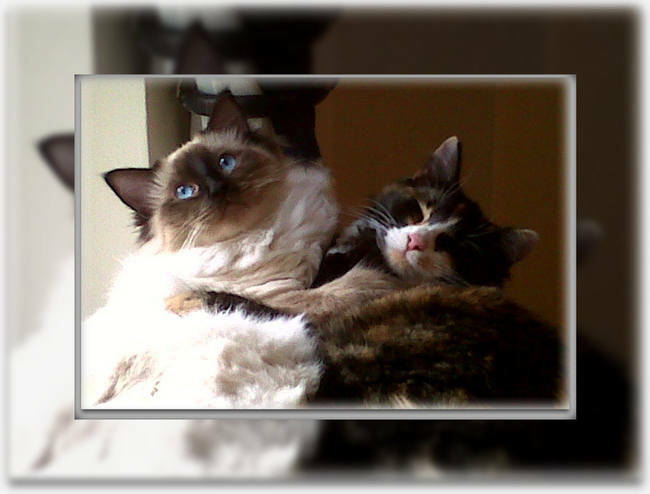 We are SO glad we have adopted Lily & Bella together; they are constantly together. They even wash one another! Lily loves being picked up & being in someone's arms for a cuddle; Bella is a bit more independent and it is a case of when she wants but once we settled on the sofa she always comes for kisses and a cuddle. 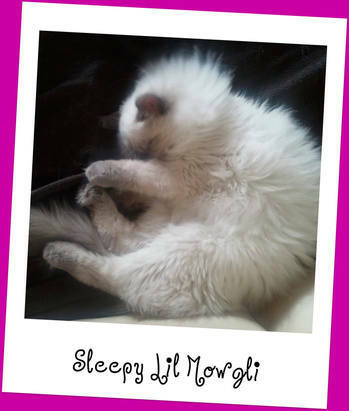 Bella always falls asleep on your lap and purrs loadly; Lily seems to prefer to cuddle up by your side but purrs too not as looud but still. Although we had one each last night on our laps! Total Bliss!!! I could go on for hour; they are bringing us so much joy! Thank you so much for trusting us with those gorgeous girls and thank you for looking after them so well! Bye for now, many kisses from the girlies and we'll speak very soon. Just wanted to give you a quick up-date after a week; you'll be very pleased to know that Lily & Bella are both doing very well. They have totally settled, made the home their home and growing well! Ian bought the girlies a new stratching pole; it is massive and they love going to the top and sit their, observing & teasing each other! They chase each other to the top; I tried to take pix but they go so quick! 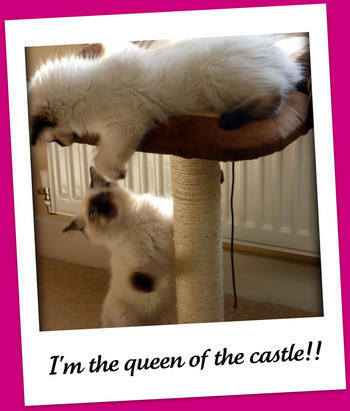 They play for hours; Bella can be a bit rough but Lily kind a give it as good as she gets! They are both ve ry loving; Lily loves to pick up & cuddled and Bella loves sleeping on your lap & asking kisses every now then. I think they have grown; It hink you will find them changed in a couple of weeks time. I have managed to brushed them! 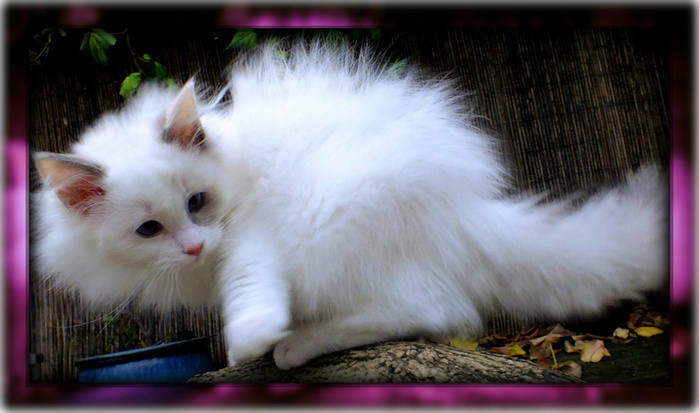 I used a soft comb; Bella actually loved it an purred a little head off. Lily wasn't that sure and kept on trying to bite it. I thought Bella would have been to difficult one but no Lily was. Enjoy the photos. The girlies are sending loads of kisses. Every night at around 9pm they wake up and start chasing each other in the whole apartment. They are so funny. Bella has worked out the noise of the front door and runs as soon as it opens! We have to watch her. They both look so healthy and settled! They always look after each other; washing each other and calling for each other. We couldn't have asked for more they are magical! If it is still ok with you we will drop the babies on Saturday 6th August at 2ish. Thank you ever so much for looking after them this week we know they are in the best place with you all. I hope you had a good week with the girlies! We had a good and relaxing week but we have missed lily and Bella! We look forward to seeing and kissing them tonight! We should be at yours between 9 to 9:30pm tonight. Gald you like the card; I enjoyed putting it together! Glad you liked the french sweets & cakes; those caramel are awesome, i'm with you on that one! 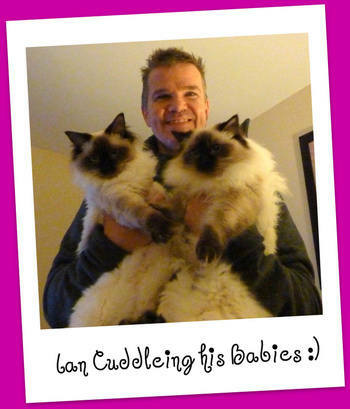 Thankyou so much for the photos of the babies with their mummy & daddy... they are beautiful! 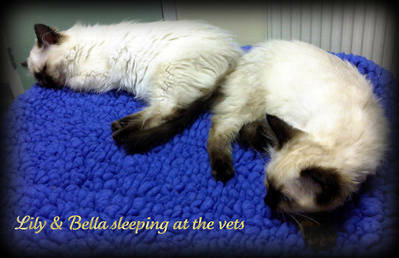 We thought we'd give you some news from Lily & Bella; well we are pleased to say they are doing exceptionally well. They are both developing into incredible kitties. Lily is absolutely beautiful and Bella as an amazing character & the love she gives (& demands). They are both very good & very happy; they are a joy to have home. Bella is still very hyper & gets very giddy when playing. Lily is ever so laid back but gives it as much as she gets! Bella can be a bit too boisterous with Lily at time. Lol. the other day I caught Bella going up my living room's curtains! She looked at me but didn't seem to bother me at all! Lol. 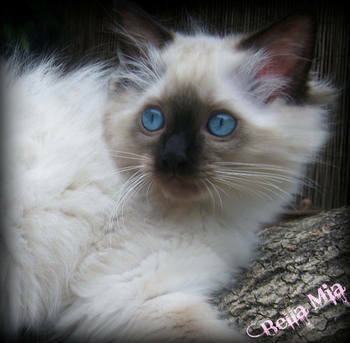 Lily has a very thick coat Bellas feels soft almost like fine silk. Lily's build is quite sturdy compare to Bella who is leaner & more atletic (may something to do with all the running she does in the apartment!). They both love meeting new people; friends, kids, delivery man, fridge engineer... you name it everyone who has met the babies has loved them! I had to check few bags before they left the flat just to make sure.... lol! 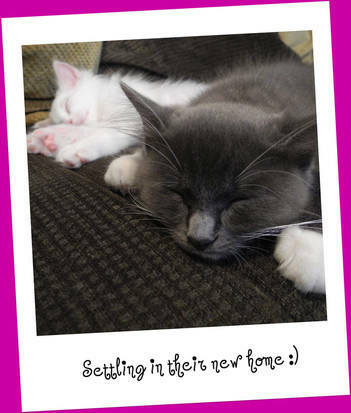 The babies are not shy and always full of interest & love with new people which is awesome! We absolutely love them and they give us so much love & laughter! We are planning to have their big girls ops mid October and Ian has already booked to be at home that week. I know I will get very worried & upset; I'm already when I think about it! I know they will be ok but I am a worrier. I will let you know the exact date but we would like it to happen on or around the 19th October. In the meatime, we hope you are all ok.
Just to confirm that the babies will have their big girls operation on November 1st. They are both doing really well; they are always very happy kitties! Just to let you know that the babies are doing good after their ops. They want a lot of fuss and kisses. I will send you the paperwok by the end of the week. 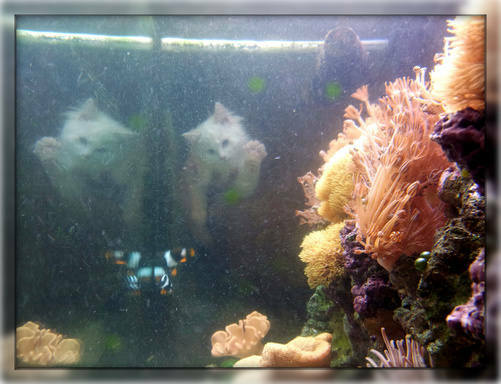 Lily & Bella are doing fine; they've been checked by the vet a ouple of times since the operation and they are healing quite nicely. Bella has had couple of antibiotics shots and anti-inflamatory drops though; she's had some fluid building underneath her scar creating a lump. The vet reassured us that it sometimes happens especially in the case of very active kitten! 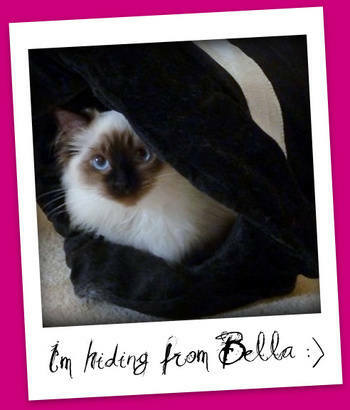 That is certainly the case with Bella! The fluid should drain itself naturally as the healing process continues but to make sure she doesnt develop an infection she's had antibiotics. Lily has been absolutely fine. She is so laid back. 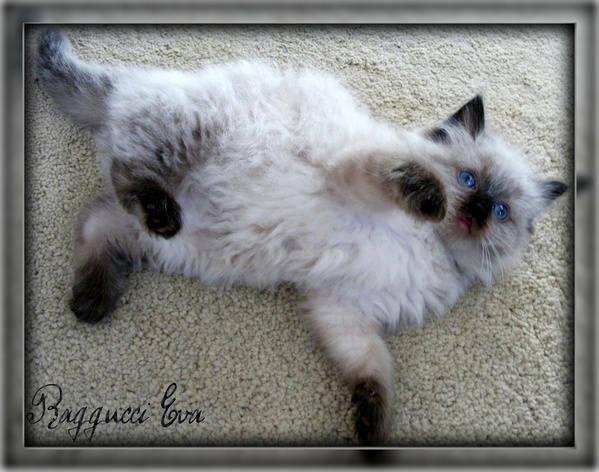 She is like a little fluffy bear demanding attention all the time! LOL I will take them back for their last check up on Thursday afternoon. 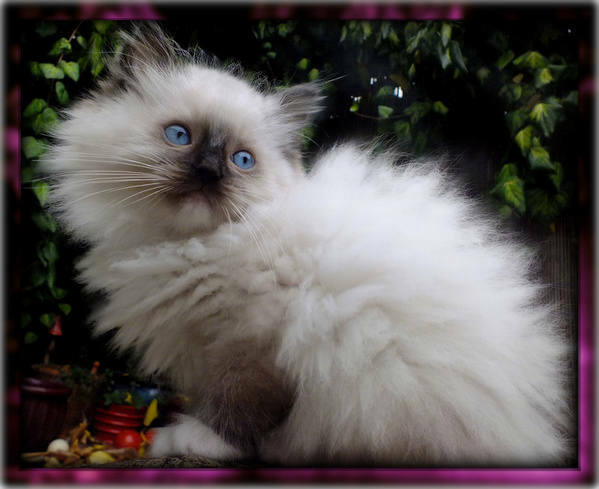 Apart from that they have been fine in herself, eating well, playing and being very loving. I have attached few pix of the babies that I took at the weekend. I love Lily's little sleepy face but she is difficult to photograph always moving as you press the button to take the photo. I will send you another up-date at the weekend once we've seen the vet. 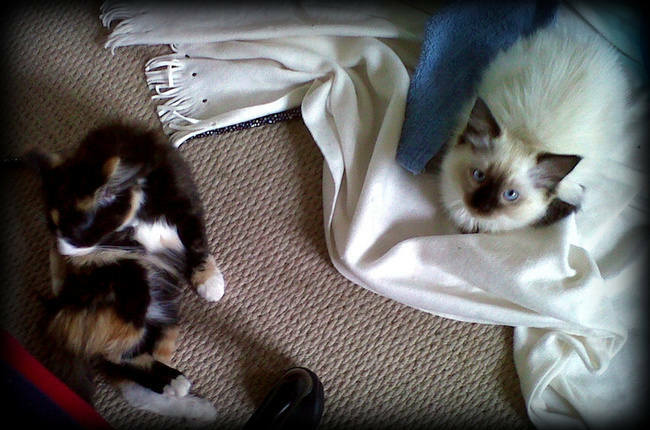 A little up-date from the babies; they have both been discharged by the vet on Thursday. 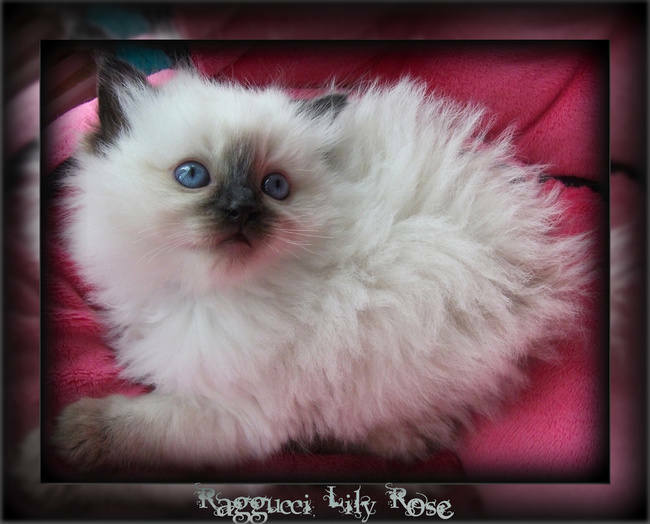 Bella has been weighed at 2.7Kgs and Lily at 3.3Kgs; Lily will be a big cat like her brother Romeo! Bella is much more "streamline" no wonder she is always so active! I've attached few pix I took at the weekend. I love the way Bella totally crashed out on my leg, the way she gives me the "Bella love" look, I love Lily's little face she is so pretty but best of all I Loooooovvvvvve them snuggling together; there is such a closed bond between them. One last thing they absolutely adore ham!? Not bothered with Chicken but ham they both go absolutely crazy as soon as they can smell it! They are so funny with it but we dont want to give them too often, so they get a little bit as a treat once a week. Clarisse, Ian & the babies. 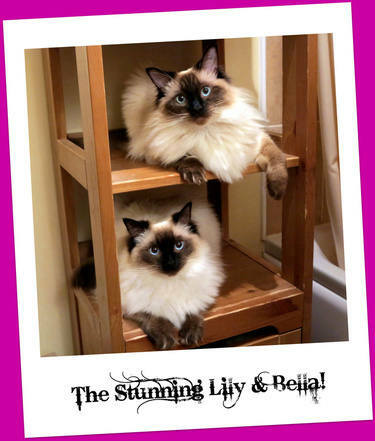 Just to let you know that Lily & Bella are going on a big adventure in three weeks time! We are all going to celebrate Christmas & see the new year in my home city; Paris! We'll stay at my parents for two weeks coming back after the New Year's eve celebrations. 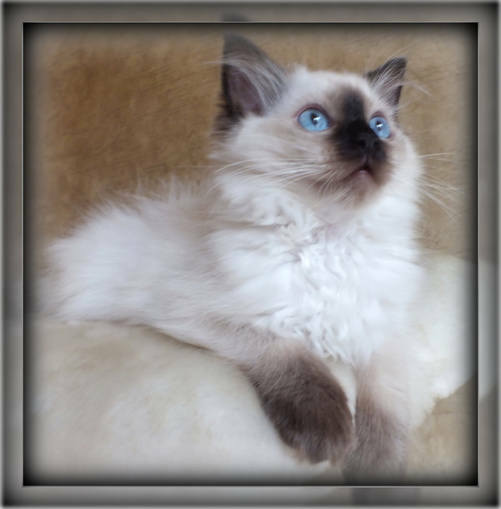 As they are already microchipped they've just got to have their rabies vacination & the vet has issued them their EU pet passport (the 2 close-up pix are teh ones I used for their passport). We've bought a massive soft cage for the car where they'll be able to move about and we'll stop regularly so they can stretch their legs, eat and ther rest! The thing I love the most is how close & loving they are to each other. 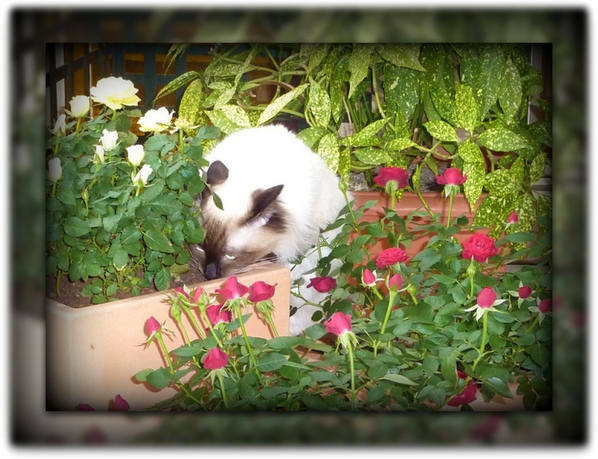 Bella always grooms Lily (rarely the other way round!). But one thing they are very loving & gentle never ever nasty or moody. They always want to be with us or shall I say on us! I hope everybody is ok at your end. Well Lily & Bella enjoyed their holidays in Paris. The car journey went without any issues; they slept most of the way! They loved my parents who adored them in return. 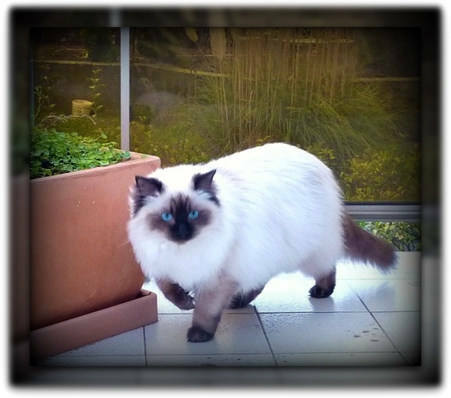 They also enjoyed exploring the the big terrasse at my parents. As we went to Paris for Xmas we decided against doing a big Xmas tree but we got a little one for the babies and they love it. I have attached some lovely pix; enjoy! Also to let you know we have received the papers; many thanks. I hope you are all ok. 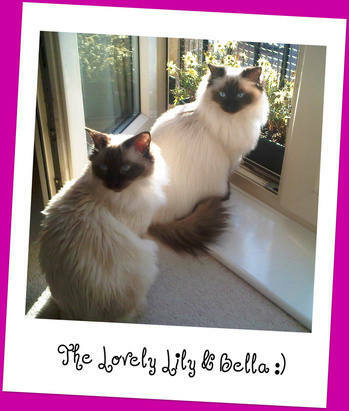 I thought I’ll forward you these two lovely photos of Lily & Bella. As you can see they are still very closed & loving. They are giving us so much joy & so much love. 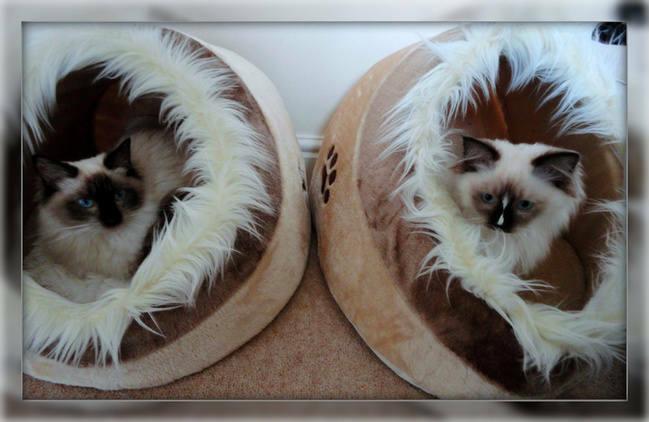 I have been trying to get another bed similar to the pink one but so far without success! I am one our 4th bed but they keep going back to the pink one! As they grown they cannot fit on just one but they won’t accept any other one! 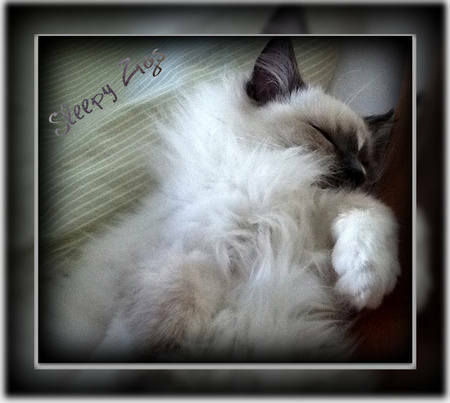 Never mind, Bella thinks our bed or my pillow is her bed anyway… They are growing into real beautiful cats; Lily has always been very cute & pretty but Bella has developed into a real beauty herself now. Lily likes to be cuddled like a baby; she stays in my arms for hours! 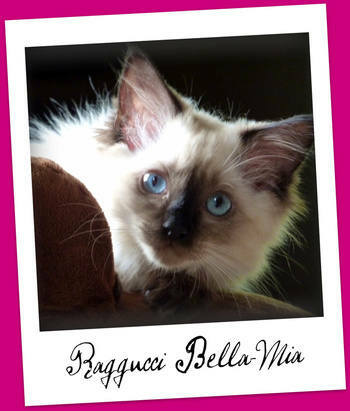 Bella likes sitting on your lap, being fussed for hours & giving kisses. She also like cuddle underneath the duvet at 5am!!!! The best part is they are genuinely lovely cats with loving nature. They like being with us all the time; they follow us in every room. I cannot believe they will be 1 yo soon! Anyway I hope all is good with you all, that Pawscha, Eclipse & Romeo are doing well. 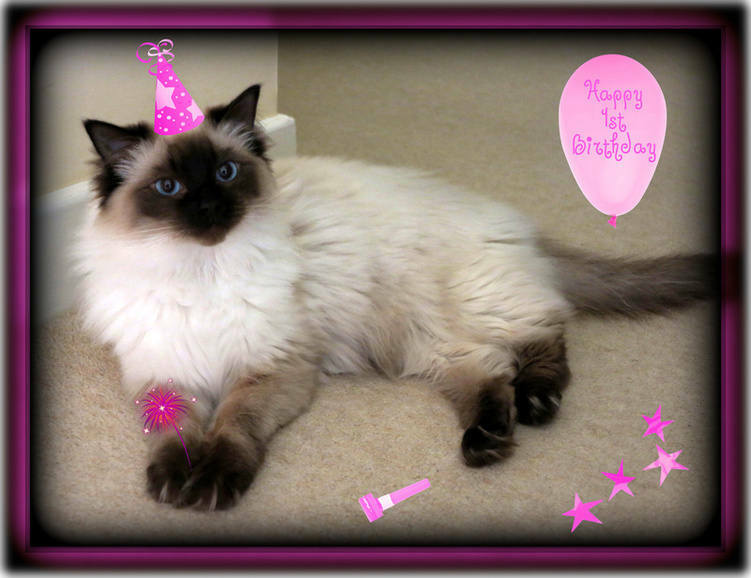 I hope you are all well; I am pleased to send you few pix from Lily & Bella as they approach their first birthday! Tomorrow the babies will be treated to a little bit of ham which is their favourite treat! They also got a new activity scratching unit and they love it! They are both wonderful company and ever so loving. 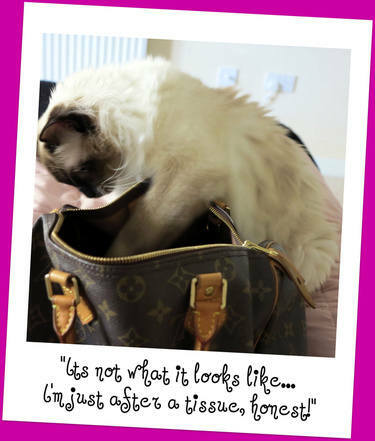 Bella has a new obsession for pack of tissues; each time I come home she gets in my hand bag to get the pack! I've attached few pix showing you how she does it while Lily looks upon! They are enjoying their adult food; I started to introduce two different royal canin adult food with their baby food and they loved it! The biscuits left (if any) are the baby ones! I've changed their litter to the adult (same brand) and there was absolutely no problem. Bella jumps on their lap & settles (& demands attention rubbing her belly being one!). 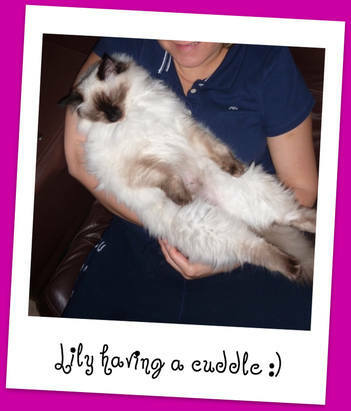 Lily is the same but she likes being hold like a baby! 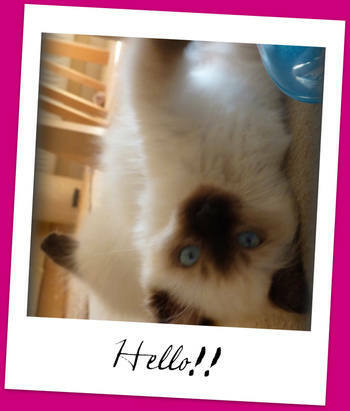 Lily is very vocal when demanding attention, Bella just pushes her way through! They are beautiful and so big now. 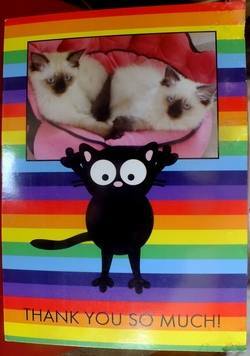 Thank you for sending the lovely card with Eclipse, Pawscha & Romeo. I thought you would appreciate an email to let you know how little Willow is. She's just lovely - I'm so surprised over how relaxed she is in her new surroundings. She is in our bedroom at the moment and slept under the bed all night until 5.30am when she looked up at me from the floor, meowed, and jumped up to curl up next to me purring loudly. She has been exploring upstairs too and has spent some time with my boys in their rooms. Sometimes she likes to lie close to you and at other times just flops on the floor. She is eating, drinking and toiletting well with no problems at all. She's been having a mad half hour chasing toys and jumping on and off the bed at full pelt. We won't introduce Theo to her for several days but he has heard her meow and has been lying in the cat carrier we brought her home in, smelling it. It didn't seem to bother him too much. Thanks so much for letting us have her - she's going to be a much loved addition to the family. I'll email again soon and let you know how she's getting along. Don't worry she is getting lot's of kisses. She's doing wonderfully, is very sweet and loveable & has been sleeping next to the laptop while I've been working on it this morning. She's now racing around after silver foil balls, a shoelace & toy mice. She makes lovely little funny noises when she's playing - so sweet! And, like your cats, she slides around the wooden floors. I've taken a few pics on my phone camera but they don't really do her justice & I must get some video. I'll send some when I've some decent ones. She hasn't met Theo yet but there is a good reason for that. 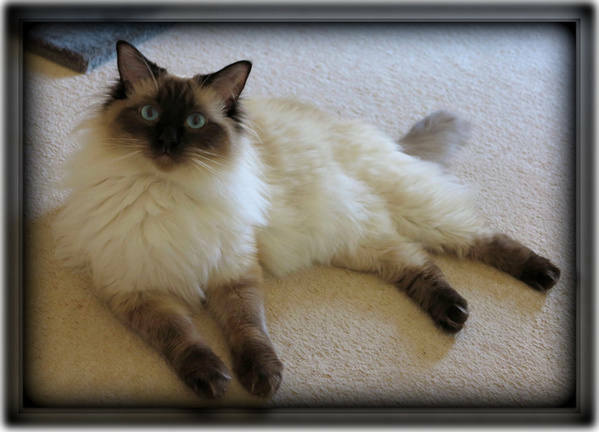 Next week during half term we are visiting my Mum in Devon for a few days and Theo is going to the cattery. I didn't want to introduce her then after a few days put Theo in the cattery thinking a new cat had arrived and he's been sent away from home. Willow will be having an adventure as she'll be coming with us to Mum's. She has a nice new travel carrier, fleecy bed and new toys to take. When we return I'll begin the introductions. They can smell where each other has been already and it hasn't been too difficult to keep them apart. They have very different lives really as he's a real outdoor lover & often just drops by for food and a place to sleep if the weather's bad!! Although he'll be indoors more during the winter. There are no problems at all & she follows me around all over even if I try very quietly to sneak to the loo while she's asleep - she's there!! I hope her brothers are also doing well & I'll be in touch to let you know how her little 'holiday' went. Willow is back from her little holiday in Devon which I'm pleased to say she thoroughly enjoyed. She travelled well in her new pink carrier and was a very good little girl at my Mum's, having a different home to explore. 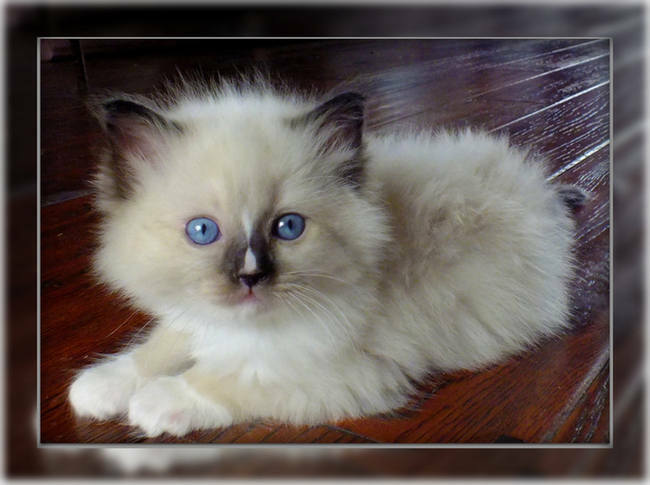 She's adorable, everybody thinks so, so loveable, playful and relaxed. She has now met Theo, although as yet, he is not too impressed!! He continues to hiss and grumble but has no complaints when he sneaks off to eat Willow's food!!!!! He mainly runs away from her when she slowly stalks him then bounds up to him from behind to play. She has started to roll on the floor in front of him making her sweet little 'guinea pig' noises as I like to call them. She just wants him to play and can't understand why Theo gives her a stare then walks off. I do hope as the days pass he'll become more amiable. He is a grumpy cat. Anyway Willow is not short of people to play with. She likes to play hide and seek on the stairs and loves to dart about chasing balls. She is with me now as she always is when I'm on the laptop, curled up on the desk. I've attached a few pics, not up to your quality I'm afraid, when I get chance I'll take some video and better photos. Most of them show just how relaxed she is!!!! 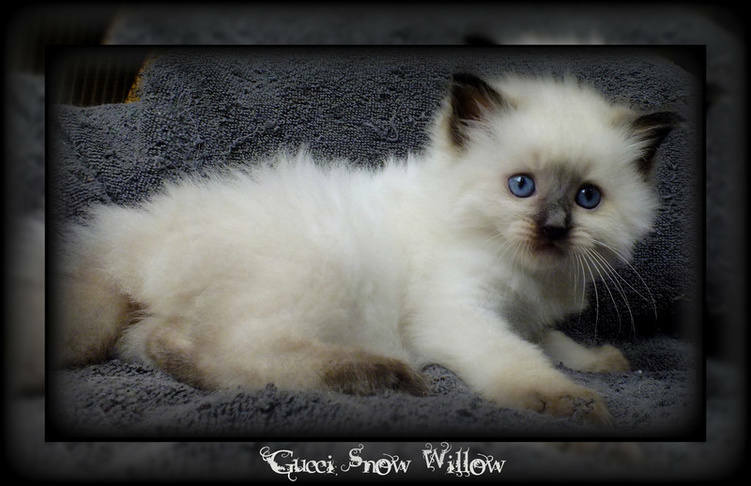 I've attached some pics & videos of lovely Willow. She becomes more adorable each day. Her coat is becoming really beautiful and it's a joy to brush & comb her, although it's not easy as she wriggles around constantly playing with & trying to eat the comb! 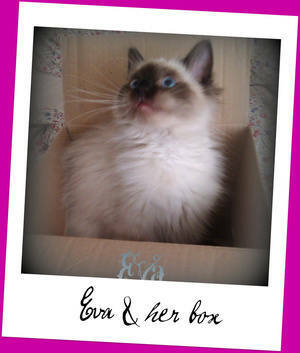 As you'll see, she loves to play with cardboard & boxes and the balls of tinfoil are still her favourite. She carries them around in her mouth and puts them in things to play with. She's like a puppy playing fetch with them but just as she gets back to me and I go to take it from her mouth she runs off with it - very funny! She races around sometimes so fast she bashes into things or she'll try to run up the corners of our exposed brick walls in the lounge! Theo is still not her friend unfortunately! 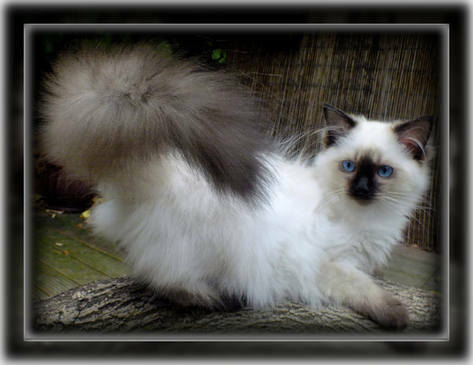 When he comes in from outdoors she hears his bell and chases and pounces on him from behind - she loves getting his tail! 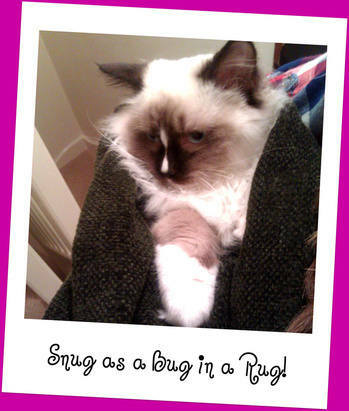 However, he either turns and grumbles or hisses or runs off to hide. I'm beginning to think we'll just have to have another raggie to be her playmate (please bear us in mind for the future!!). 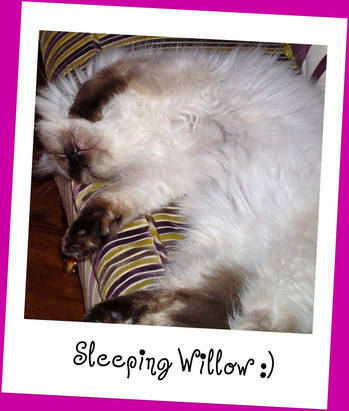 Willow is such a good girl, she gets so much attention & lot's of cuddles - we love her to bits! She's with me now while I'm writing this, snuggled right up to me, upside down, purring away and half covering the keyboard - sweet! P.S I haven't been able to attach the longer video as my email has a 25mb limit. I'll send via my partner Mick's address this evening if I can. Sorry for the late reply - I'm just soooooooooooooo busy! 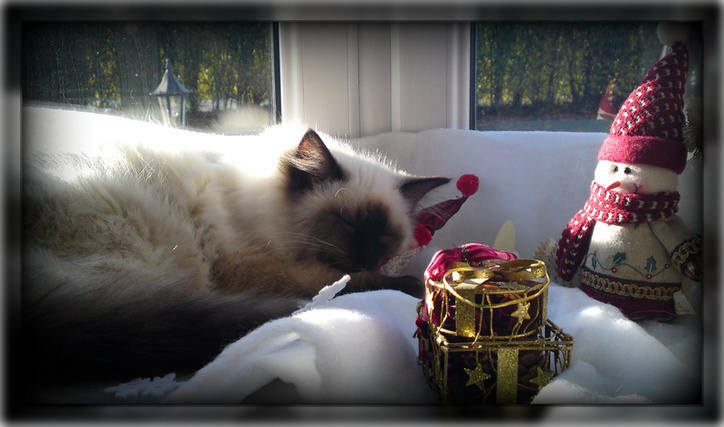 Thanks so much for the lovely Xmas pics from Willow's Mum & Dad etc. What a nice surprise. 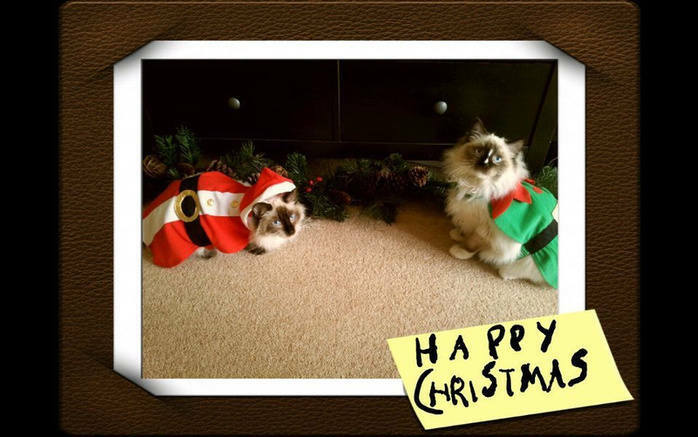 I've printed them and they are amongst our Christmas cards. Willow is doing great & is very much enjoying helping to wrap presents and playing with the decorations. She still follows me everywhere and mieows frantically at times if she can't find me. Theo still doesn't like her much but they are very funny to watch as they do chase each other around the house and Willow lies down in front of him and pulls herself along the floor to see how close she can get before he runs off! She follows him about making lot's of little 'play with me' noises - so cute. Her fur is becoming much darker on her hind quarters and tummy. I'll update you with some more pics soon & I must sort out the video too - I haven't forgotten. Anyway for now, have a great Christmas, we will too, and a very happy new year to you all. 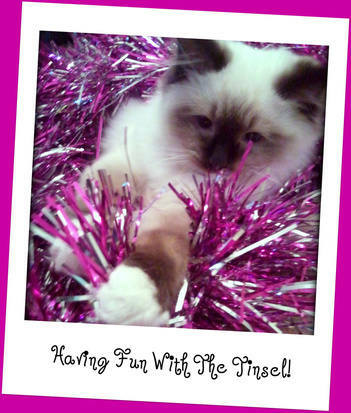 I'll be arranging Willow's neutering after Christmas. 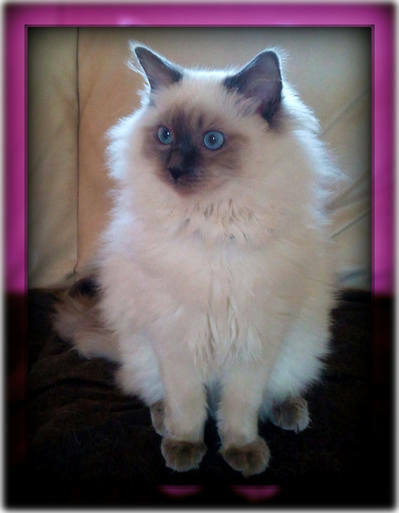 Just a quick message to let you know that little Willow is booked in for spaying on Friday (13th Jan). It's a long time since I've had a female spayed and I'm sure I'll feel a bit anxious until I know she's ok & I'll miss her not being here for a few hours. It'll be nice that all the familiy will be around at the weekend to give her some TLC! She's really growing well & is happy and contented. I've just a couple of queries if you don't mind. 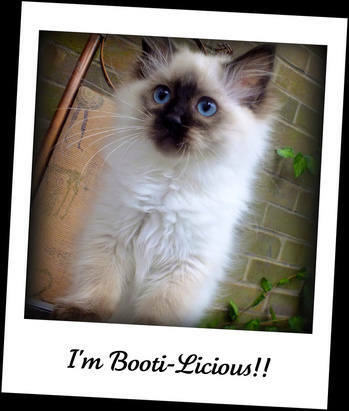 Do you continue to feed your cats on Royal Canin & which do you recommend after kitten 36? 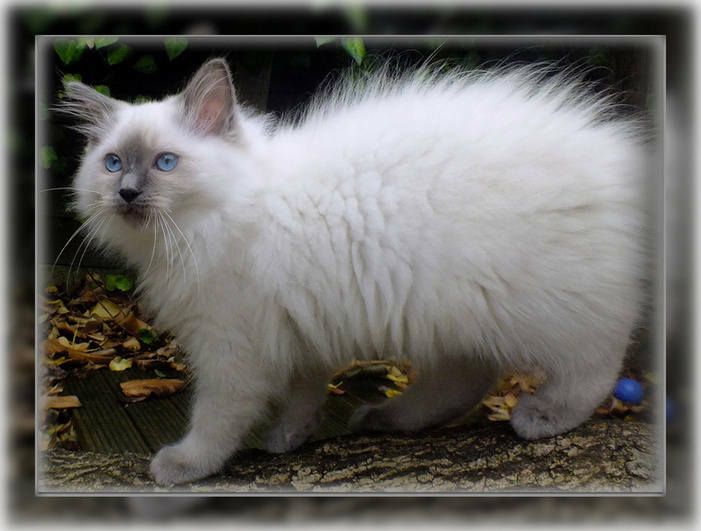 She also has one wet meal (Royal Canin Instinctive) per day. I'll be in touch again on Friday evening with an update. Just to let you know that you'd never know Willow had had her op yesterday. 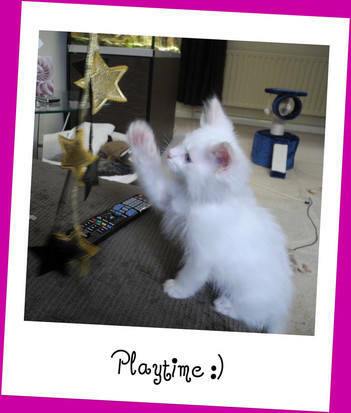 It was hard to stop her from acting as normal - bounding around, jumping & climbing!! She was very happy to see me though when she came home. She's a little more sleepy today but I'm sure yesterday's extra energy burst must have taken it's toll. Us humans would never be like that!! Good for her. 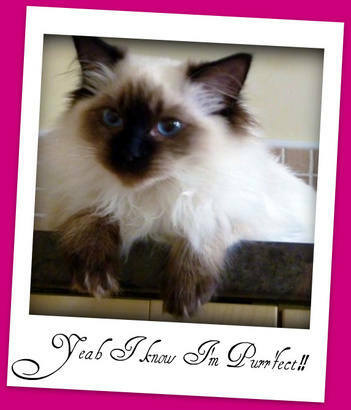 I haven't forgotten about returning Willow's neutering certificate, I've been extremely busy :) I aim to get it in the post to you Monday or Tuesday. Mowgli is doing well. Once we were home he was very happy. He kept on cuddling and was directly very close to us. He did eat is food and played directly. He loves the soft meat treat and his cat mik. At 6.15 in morning he meowed and wanted milk:) I did not see him drinking water yet. He loves his cuddles and like to be held. He keeps on purrring ..... all the time. Did use cat tray very good. He's so sweet. Will keep u update. First lots of kisses xxxxxxxxxxxxx and love back from Mowgli. Yeh he's so sweet and cuddling. He wants to be close with us all the time. He keeps on purrring. He sleeps with us in his basket on the bed. He loves to get crazy with the duvey. He's v exploring jumps from highs he don' t mind:) I did already introduce him to our dog. He was on my arm. Herby was v happy to see him I think he thought it was Dewey. But Mowgli was v upset. Herby got scared of him and just kayed down didnt dear to move, poor dog. Today is first day can go through whole house. Herby stays away from him because he's scared. I had Mowgli on my arm and they snift each orher, but when Herby us moving Mowgli becomes upset again. It will be ok, its just Mowgli did never see a dog before. Mowgli is now sleeping on sofa in blanket and dog is laying outside enjoying sun. They both can go were they want. Mowgli likes running stairs and bedroom is ipen so he can also go there. He koves cat milk andsoft treats but is not eating much dry food, I have to stay with him and show then he eats a little. 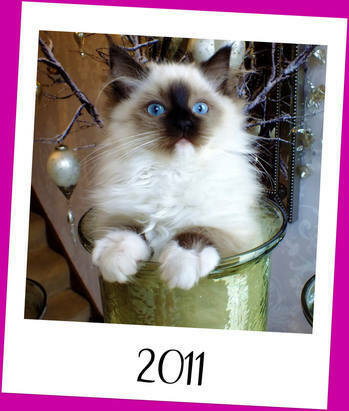 Can he have as much cat mik as he want? Everything is going v well. They r going on well now. Even play little together. Mowgli is so sweet, like a baby; likes cuddling and kisses lot and to be hold. Follows me everywere around the house. Can u pls tell me were u did buy the soft treat sticks from. Mowgli loves them and I want to buy some more later. Sorry for waiting so long for my email. and then run and attack his porch. Mowgli jumps on him they run around grazy, it`s fun for to see. But sometimes they get too wild and then I have to stop them. Mowgli is really settled in. 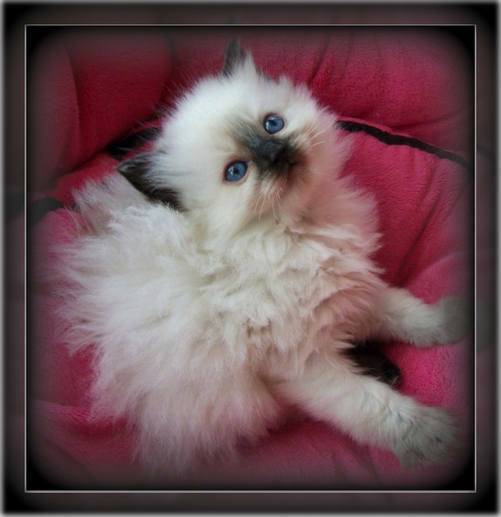 He`s very sweet but can also be a little devil. He knows exactly what he wants. He loves his cuddles and like to be held. He`s also giving kisses and he still follows me everywere. At night we take him in the bedroom because otherwise Herby doesn`t get any rest. They have a big party when together. I have a basket for him on the bed, I put him in there bus as soon as the light is off he goes out and comes to me and likes to sleep on my arm or somewhere warm, so he can feel you. He keeps on prrrrrrr then very loud. He`s eating very well. 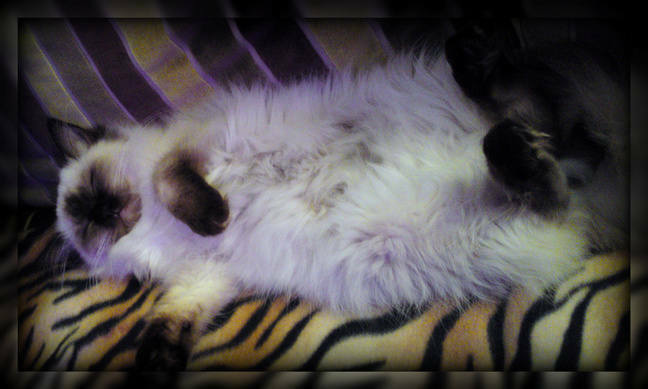 I still spoil him too much :) He get`s some Felix meat over his dry food and cat milk both in the morning and evening. The rest of the day he has his dry food available and water, although he prefers to drink from the dogs bowl. 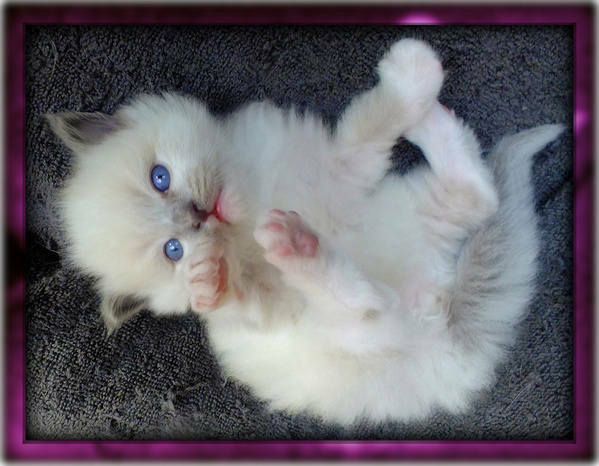 He`s growing unbelievable.....so quick. We did make a lot of pics, But I need to ask my partner for the cable to download them, sorry for waiting so long. I think it`s enough for now. I better stop because I can keep on talking about them. Oh before I forget when does Mowgli need to be wormed again and when do I have to give him this treatment. P.s everybody says he is just like Dewey....... :) I also think that. First sorry for not to being in touch for a while, but have been very busy. Everything is great with our baby Mowgli.... His big brother Herby and him love each other to bits. Please don`t worry about him. He`s doing so well. I`ll get back to you soon with a very long email and pictures. 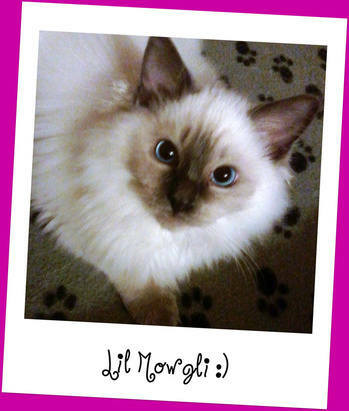 XXXXXXXXXXXXXXXXXXXXXXXXXXXXXXXXXXXXXXXXXXXX and love from Mowgli. 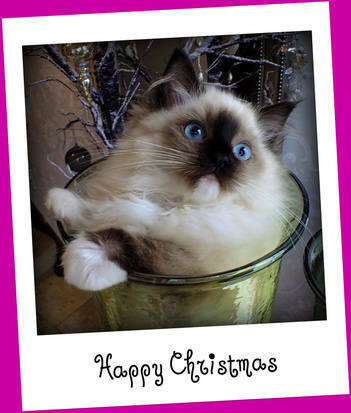 Hi Jo, I hope you are fine and all the cats too and that you all had a lovely x-mas. I wish you all a very happy new year. Thank you very much for your x-mas greeting it was very nice. Sorry for not being in touch for some time, but we didn`t had internet for a while. Mowgli is doing very well. Getting naughty a little bit more, but I think that`s his age at the moment. he and herby are so lovely together they are playing, sleeping together, eating together, just being together all the time. They are both spoiled too much. They loved their x-mas. Opening all their presents, they really enjoyed it. And Mowgli enjoyed jumping in the tree and catching the balls. I`ll send you some pics. for the moment and send you some more later, with a longer email. I hope you are all feeling better now and recovered from the flu. Thank you for letting me know that you like our dog too........ Yes he`s a very special and gorgeous dog. 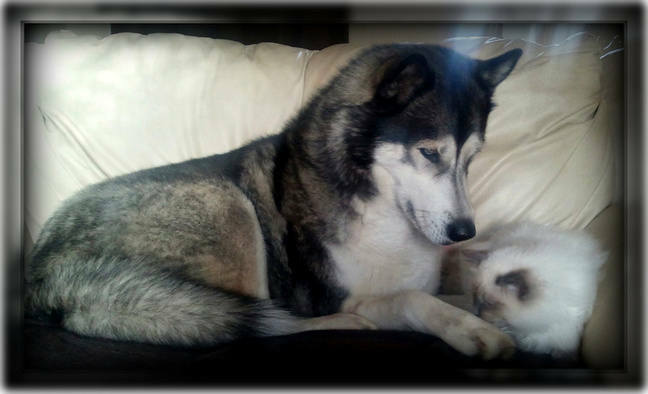 He`s so sweet and well behaving, specially for a Husky. 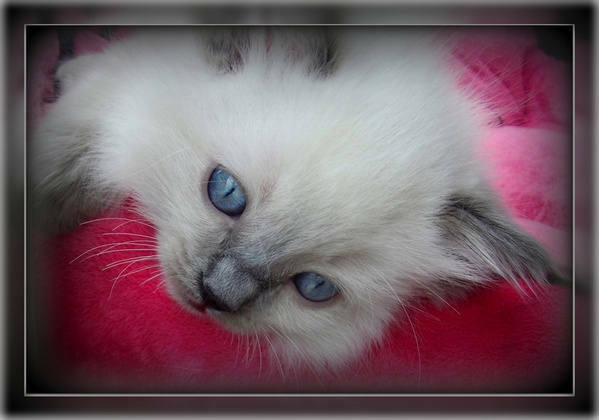 Everybody is telling us how special he is and how good looking he is with his beautiful blue eyes :) even the vets..... But I still feel very happy and proud when I hear it again. Thank you for that. He`s still our "little baby". 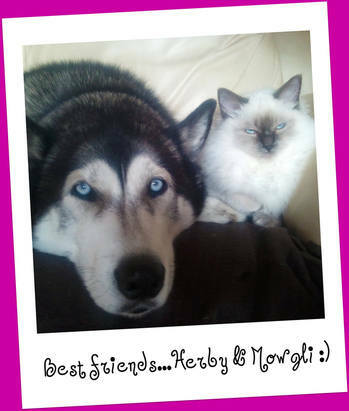 Yes Mowgli and Herby are so sweet together, they really love each other. and I have to watch now that they are not too wild....And I have to watch that he`s not licking his wound, but it`s already better. 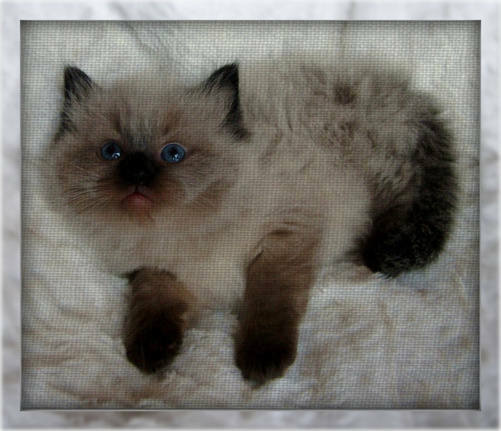 I`ll send you the vets papers of his neutering next week. 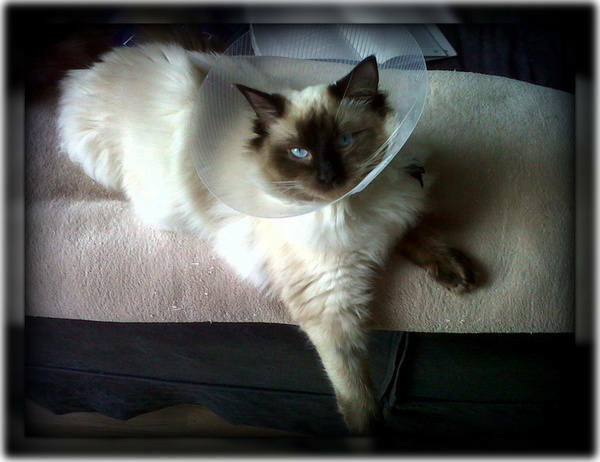 I`m happy it`s over and that he`s neutered and ok, because I was worrying too much. I`ll send you next week an email with a video from them playing together. Funny Mowgli he`crying at the back door many times because he wants to go in the garden with herby he doesn`t understand why he`s not allowed now. He has to stay inside for about one week. Lots of love and kisses xxxxxxxxxxxxxxxxxxxxxxxxxxxxxxxxxxxxxxxxxxxxxxxxxxxx from Mowgli to all of you. We just wanted to send a little update on how the girlies are settling in. Well they seem to really like their activity centre and have even established the tallest laying spot as their bed! Pepsi occasionally prefers to sleep under the single sofa bed, but has stopped hiding there when we entre the room which she did on the first day...bless. They are both playing, eating, drinking and using the toilet well and even treat us both to a bit of a purr and a cuddle occasionally. We've introduced the scent of the dogs which to start with caused great excitement followed by a big play session but now only warrants the occasional sniff! They are enjoying all the toys, but the tissue gift wrapping is a big hit and of course the wand! I've taken some (awful) photos with my phone which I'll send in a separate email. Just a little pic of the girls chilling out with the pups this afternoon while we're watching a movie. This was taken just a moment ago and thought you might like to see it. As you can see the introductions are going very well and the girls are very happy. Hi Jo & Jordan, the girls are growing fast! They are very lively! They enjoy playing with their brothers and cuddling up with them for nap time. Tilly even sleeps next to them on her back sometimes copying them! Funny and cute! They are very good girls. They have learned not to come into the kitchen when the door is open and stand patiently waiting for us to fetch their ball when it happens to roll in to the kitchen. They are very clever. Pepsi's a real hunter! When we aired out the living room during the heatwave last weekend a lot of flies came in. So when we closed the windows we let Pepsi and Tilly in and they cleared the room in 20 mins!! The best Pest controllers around! Tilly is a soppy one. She loves her cuddles and if she's not getting enough she follows us around the house meowing till we pic her up! She's adorable. Pepsi likes her cuddles too especially in the mornings when she comes to wake me up. They are a joy. We're so lucky to have them. We're well thanks - the girlies are growing into fine young ladies! Their 6 monthly check up went well and we're going to book their op in Dec. Unfortunately, I've been made redundant recently so I've been busy trying to find another job - fingers crossed it won't be too much longer now. The up side is that I've been able to spend more time at home with them and the pups which is really lovely! Pepsi's a real character - she loves crawling around in the bed covers and running around the house leaping from one bit of furniture to the next. Tilly is the lady of the manor. She loves sleeping on the floor - usually in a spot where she can conveniently see everyone - or cuddled up to one of the puppies. 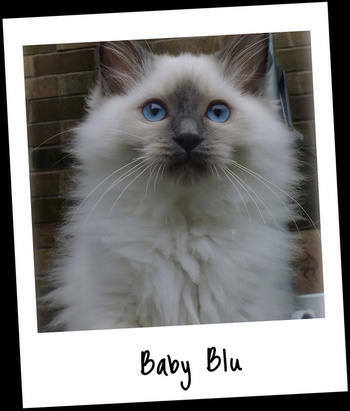 She's really affectionate and loves her cuddles - let's us know with loud and clear 'miaows' when she wants attention - so we call her big mouth! They are happy and healthy and they are keeping us happy and healthy too. We'll send the paperwork about the operation to you once it's done. 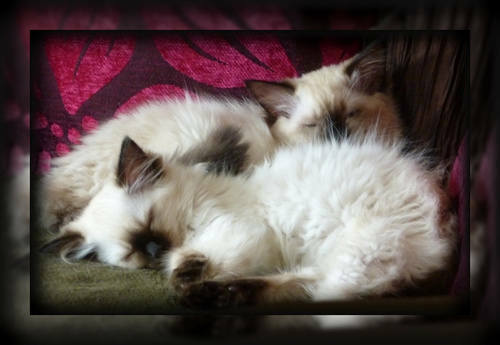 We've booked the kittens' spay operation on Tues next week. I'll drop them off first thing and collect them in the afternoon as soon as the nurse calls. Will let you know how they're doing afterwards. They're getting bigger now so it's a bit of a tight squeeze in their tower but they still love their cuddles together! Big xxxx's from the girls to you all. The girl's operation went very well. They are both lively already and adjusting slowly to their new head gear! They keep trying to back out of them and they really struggle to get up the stairs (funny). What do you need us to send you? All I got from the vet so far is a receipt. But I'll happily ask for what ever you need. Yep, they are recovering very well. They are belting around the house now like nothing happened and seem not to even notice their head gear anymore! The bit they've found most frustrating is that they can't clean themselves. Luckily I've been home to wipe them and brush them a few times a day and the pups have been helping too by licking them which the girlies really enjoy! Yes, I found the neutering cert. 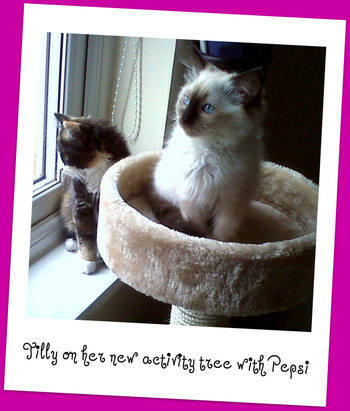 And I'll give it to the vet to stamp and sign on Thurs when I take the girls for their check up (can't wait!) Then I'll post it to you, recorded delivery. I hope ur enjoying the snow as much as we all are! 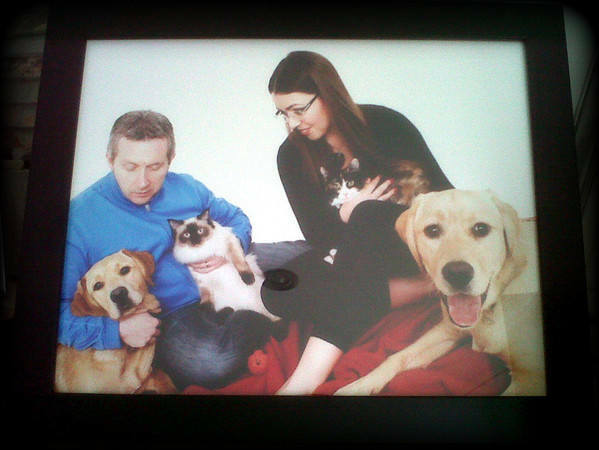 We had a family portrait done by professional photographers. Yes, we received the pink registration slip. I'll post it to the association. You'll see in the other pic of the girls that they are turning into little ladies now. Very active and animated too. They are very fond, playing fetch, chasing each other and the pups and of cuddles with all of us, my husband and the pups (not so much pups anymore either). 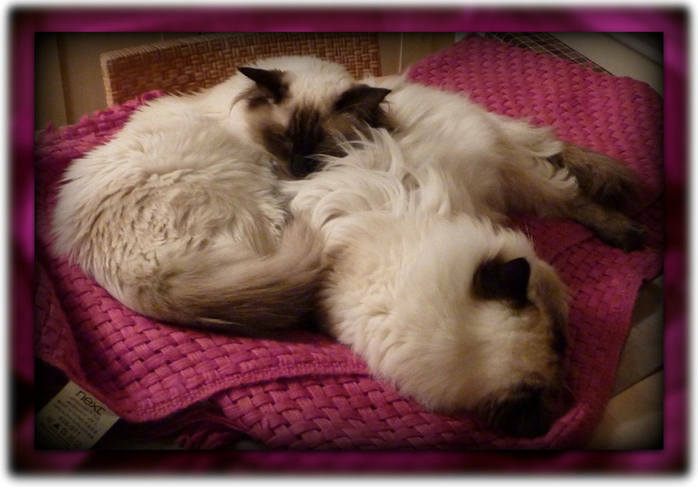 We often find all the animals curled up together - very sweet! Tilly is a little adventurer - she had a good play in the snow yesterday (supervised by us and the pups) but pepsi didn't like the wet and preferred to stay indoors, warm and dry (smart girl!). They've had a clean bill of health at their last check up with the vets a couple of weeks ago. Their weight is good and we've started brushing their teeth now too to avoid any gum problems. They are a joy for both of us and we love them to bits! Anytime you're out our way feel free to pop over for a visit! She's doing really well !! 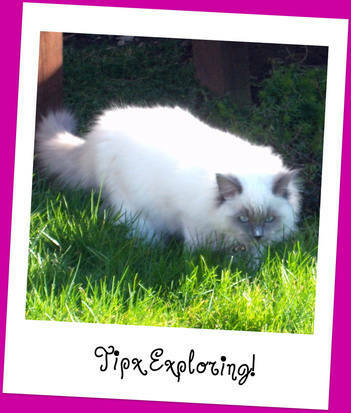 but she has been exploring too. 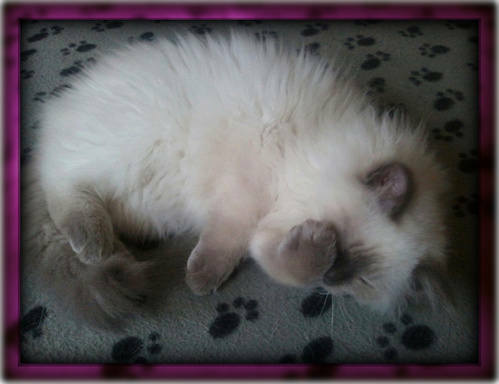 Last night she really came out of herself and was so playful... a bit to playful really :) we slept at 3.50! So I might try to settle her downstairs tonight if she takes to it. but I surpose that will take time. It's just that she has been so good, I forget I have not had her long. Keep in touch, love Maariyah. sorry have not been able to get back to you. 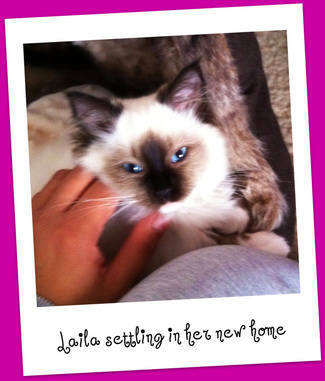 Laila is well she is eating and drinking well and is her normal happy, playful self. phew it has been a hell of a week!! Laila is well, she's gained weight :) Laila has fitted right into the family, loves all the attention and would much rather sit on some ones lap than on the floor:) she is still a little intimidated by the boys but doesn't hide from them or any thing. We love her and can't imagine our family without her now! Thanks to you. I hope you guys have a great Christmas. Keep in touch! Laila gives her love:). Love Maariyah. Lailah has been very well but recently she has been making strange noises due to her being in season, as advised by the vet. we arranged for her to be neuter and as it happens, she was neuted today at Barrajos and it has all gone well, i believe. I will ask Maria to give you a call. We have got her neutered yeterday at Borrajos Veterenary Clinic in Birstall, she is back home with us now and im trying my level best to get her to take it easy and rest it out, she was really excited to be back home from the vets yesterday and started running around and jumping all over the place, but ive made a little hot water bottle for her and she is sat right next to me snoozing:) she has not been sick after the anesthetic or any thing yet but im only giving her a little amount of food and water at intervals for the next day or so since thats what the vet advised me to do. we will always be gratefull to you for giving us our Laila who has become an important and very loved member of our family!! She is getting back to her normal self now and we are releived to have had it done!! Hi jo hope you are all well. We are all doing great, laila is getting back to her normal self now and the fur on her stomach has grown back. 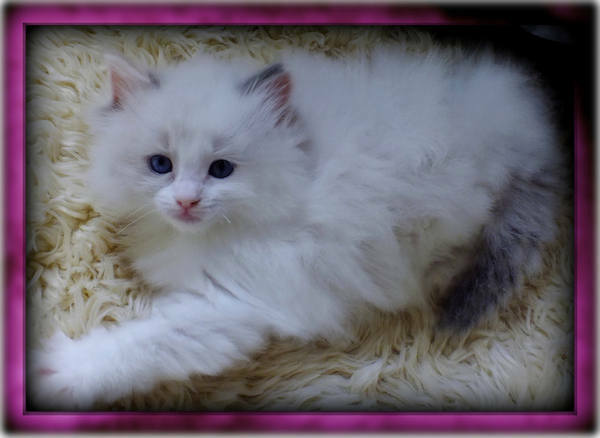 I had seen my friends Zain's cat (the kitten you sold to them) barakah a few weeks ago, she is beautiful! - a lot fatter than laila so I took her to the vets to have her weighed and measured. Since she is the first cat in our family I really have no idea as to what a six month old kitten should weigh and stuff, any how they told me that her weight is good and she is nice and lean which was a relief:) also I wanted to ask you if it is still ok with you for us to leave her with you when we go on holiday. We are going on the 30th march and will be back on the 20th April. Please let me know as soon as possible so that I can put that out of my mind because I'm really sceptical to leave her with any one else. Well that's all for now I guess! I will look forward to a reply from you. Take care jo. 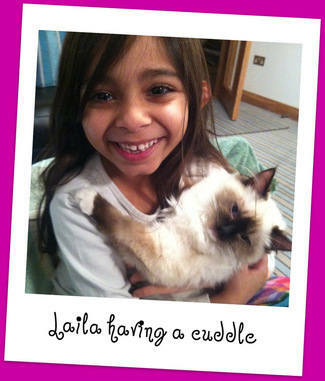 Love from laila to all her family:). Maria. Hi jo thanks for getting back to me so quickly:) its always reassuring to speak to you about lailah! 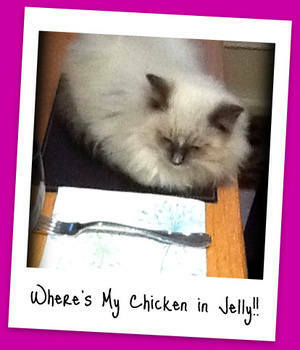 Yes she is still on royal canin 36 but also has Felix jelly, half a pouch at 12 noon. How shall we go about introducing her to other cats? Would you like me to bring her down a couple of times before hand? Thanks a lot for agreeing to have her. I can be at peace knowing she is with you:) we can arrange to meet up if that's the case, let me know which ever way. We leave on 30th march at 5 in the evening. I would like to bring her to you in the morning on that same day. Is that ok with you? I'll look forward to hearing back from you. Take care jo:) love Maria. Hi jo we are all well and enjoying the heat. 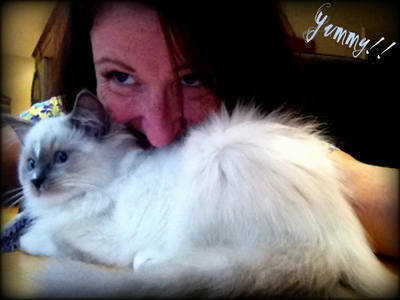 thank you so much for having her because I feel really comfortable knowing that she is with you and her kitty family. Lots of love to my baby laila, and you guys , Maria . 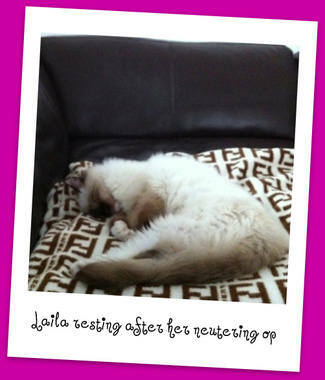 Thankyou for your mail, im really glad to hear of lailas well being:) I knew you would take good care of her. well lots of love to her and best regards and love to you guys. take care Maria. Thought i'd give you a quick update on an eventful 24hours with Barakah! She is well and is making herself feel at home. She didn't sleep much last night and woke me at 1am by jumping onto the bed and snuggling into me whilst purring away. She has eaten and drank well today and is using the litter box...twice so far today. 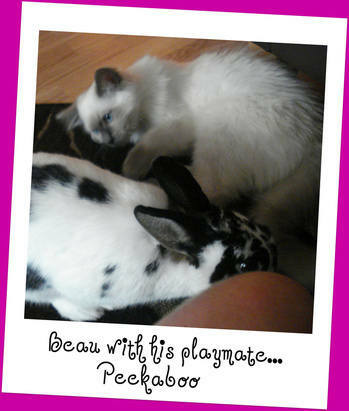 She was in a playful mood this afternoon and interacted well with my daughter Zaynub playing and running around. As i write she has jumped into bed and given herself a good clean. Thanks for the kitten pack. Bye for now. Barakah has settled in now very well and loves the attention she gets from all. She is eating and drinking well and growing quickly. She does however like to sleep in the afternoon and want to play at night. Will send some pics over the weekend. Barakah is doing very well and it feels like she has been part of the family for years...lol...she spends a lot of her time playing with my little one and te reminder sleeping. Am not too good with photos but will send some through shortly. 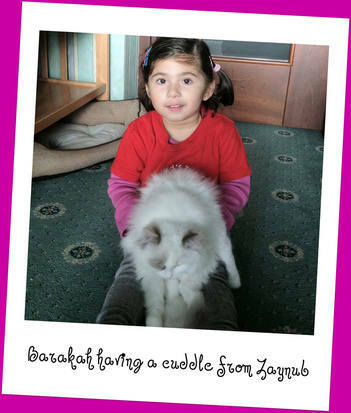 Barakah is doing really well and growing very quickly. She has bonded with all the family and loves the attention. I plan to take her to the vet next week for a general check up and also to book an appointment for the neutering. I was not able to make the appt with the vet as I had to travel to Dubai. I will be making a new appt this week and will keep you informed. Barakah is doing very well and growing up quickly. We are all extremely pleased and happy with her. Hope you have heard from Maariyah re Lailah. 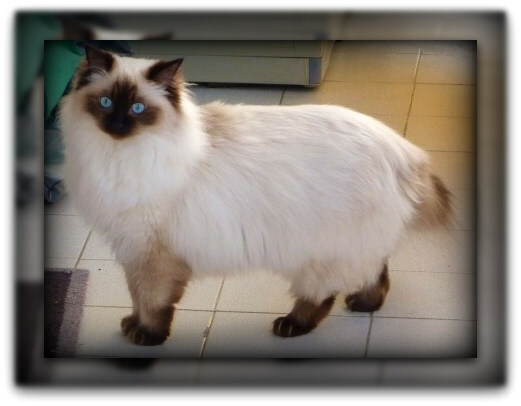 I am travelling again on 19th March and Barakah will have to stay at a cattery for 10 days or so. I have not decided which one yet...any recommendations? 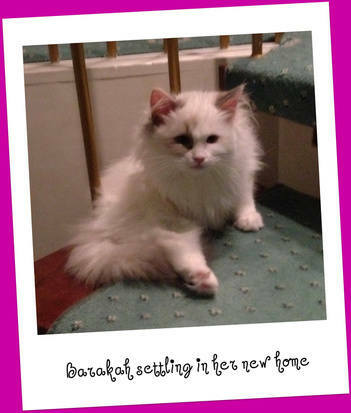 Barakah has been booked in for neutering at Bell, Brown and Bentley on London Road on my return, Mon 5th March. 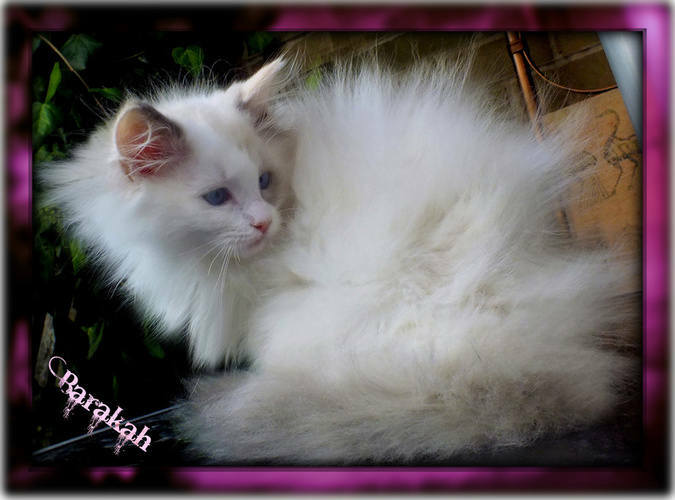 Barakah has been neutered on Mon 5th March as has become her normal self very quickly. Please advise of correspondence address so can forward receipts and paperwork to you. Do you require originals or are copies okay? We ended up keeping her with the Inlaws instead of cattery where she has been very happy. First thing I would like to say is thank you for holding on to Tipx for me that little bit longer . Thought I would let you know how Tipx settled in, in the car at first he was crying a little so Sydnee thought she would look in on him as she did he put his paw out and got her nose lol after about 5min he went to sleep. When we got home I let him out of his carrier and he come out right away and there was no stopping him he was into everything even went into his goodie bag. He hasnt met the dogs yet I thought I would let him settle in a few more days before I do that to him but he has been on their beds so he knows their smells. He follows me everywhere when I was cooking dinner he sat there watching me . He spent the night on Sydnee's bed and we didnt hear a peep out of him untill we got up. He has eaten and drunk well since last night, he has used his litter box so all seems good so far, he loves his toys esp the hat he rolls about in that he is so funny to watch. He has lots of cuddles and he has been purring so that makes me feel better knowing he is happy esp after leaving his family. Sydnee is one happy little girl and is over the moon with him I had to bring him out to her school bus this morning to show everyone . Thank you for our baby boy and for giving us the chance to own this wonderful breed. (I did say he will be spoilt LOL). I just hope he likes it as much as I do lol. The lady who I got the walking jacket from asked for a photo of Tipx when he was wearing his jacket so I sent in on of him standing like a dog (the one you took love that one ) she has put it on her web page so have a look. I will let you know what happens. I hope in some ways I can get it out the ways. 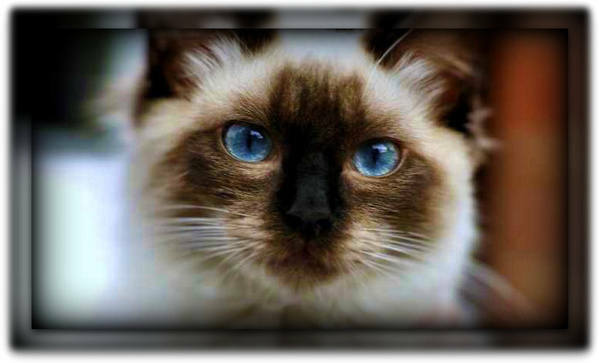 I will send you the neutering certificate the vet has signed and stamped for you asap. At least he has been done better sooner than later and its out the way poor little might . I will let you know how he is when he is home. This vets usely do kittens at 5 half months but coz Tipx was the right weight for the op and had both his balls they went ahead with it. You can call them to see if they can help you with what you want. This is a link to the vets I have gone to http://www.vets4pets.com/ I have gone to the one in Oadby (this link is to the vet I went to ->)http://www.vets4pets.com/find-a-practice/vets4pets-oadby/ but there might be one closer to you have a look.. Yesterday I called around all the vets to see how young I could get him neutered and how much it would be and then bingo this vets done it for me . I have posted the paper work to you and I will let you know later how Tipx is bless him . Everyone fell in love with Tipx there they said he was such a good boy and well behaved bless him he is back home with me now I picked him up at 2pm he is as lively now as he was this morning when I took him to the vets lol he got out of his box and started to play with his toy mouse lol then run up stairs to get something to eat. I thought he would have the hump with me but all he wants is lots of TLC and cuddles and wont leave me alone bless him . Im so glad he has had it done now as its all out of the way and I dont have to put him though it again bless him. Tipx is a very brave boy he has done so well after his op he has had lots of cuddles fuss and treats he is still a crazy little boy, he thought he would be very helpful with getting the clothes out of the tumble drier lol and got into it to play with the tumble balls lol.. he loves to watch my parrot and she always swears when he gets to close to her (nice bird lol) she is now calling his name so he comes running thinking its me calling him lol or if she meows he thinks its another cat calling him he runs to try and find it but never does- looks rather puzzled bless him.. He met the dogs for the first time the other day I cant beleive how brave he was he walked up to my biggest and sniffed him and when Chops sat up to see what it was Tipx just looked at him to say what you gonna do about it lol not a hiss or a puff to try and make himself bigger I couldnt beleive my eyes I dont think it will be to much longer before he will get into their beds to sleep with them . He is one big fuss pot he follows me around the house meowing if he thinks I havent seen him he has even tried to get into the bath with me (I dont think he will like it very much ) every so often I would see 2 paws and 2 big blue eyes looking at me lol he did find a place where he was happy to sit and watch me in the end. I'm as ready as I can be now for christmas thanks .. Hope you are ready for it? Tipx is doing really well, we went down south to see my family today and Tipx come out for the day with us the family loved him Tipx was such a good boy he had lots of little girls to play with him and when he had enough he sat on the back of the sofa to sleep (he love to sleep on the top of my sofa at home one of his fav sleep spots). As much as he loved to play with all the other kids today I think he enjoys the quite life at home as when he got home he went to his fav place in front of the fire and went to sleep . The family couldnt beleive how well behaved he is and how loving he is .. He goes out for little walks everyday and has started to want to go futher now,(thats sydnee's job) you know when he wants to go for a walk coz he will meow at the front door ,he still is a very brave boy with the dogs and doesn't mind them at all . Where I am Tipx is its like me and my shadow lol the amount of times Ive triped over him lol..
We wish you all a very merry chirstmas and wish you the very best for 2012. Hope you all had a lovely christmas and a very happy new year to you all. Tipx loves a fuss he is one big fuss puss but at the sametime he is very independent and wants to do things his way or not at all. I thought I would drop you a line to say how little man is doing ... well he is getting really big he is a right fuss pot, he loves nothing more than to sit by the fire when he isnt doing that he is meowing in my ear lol (never shuts up) or helping Sydnee with her laptop but when he has done helping her he will curl up on her bed next to her and goes to sleep untill I call Sydnee then he comes downstairs with her to see what he can get to eat (he loves his food) .... he loves Sydnee to bits he knows when her school bus is out side as he will sit on the arm of the chair meowing for when she walks in the door and follows her up satirs while talking away to her lol.. I did take him into the garden when we had snow he wasnt a happy boy and couldnt wait to get by his warm fire place he did have a lot to say to me when out in the snow and beleive me if I could of understood him im sure he would of been calling me afew names (not nice ones either lol) I wouldnt mind we wasnt out in it long 1-2 min. I have taken some photos of him in the snow in the garden I will send you some when I have lernt to put them on the laptop (new phone)..
Tipx is a fab kitty he is funny he loves to be with us all the time he has always got something to say even if he dosent need to say anything as much as he love to be around us and having lots of cuddles he has a mind of his own. Hope your all well and chantelly isnt missing Beau too much! He's settled in really well. Very proud of how brave he was in the car. He loves all his toys seem to play for 20mins then sleep for a couple of hours so cute. He's met Peekaboo the rabbitt they get on really well keep kissing each other on the nose and follow one another round the living room. Beau has got run of the house as its 3 storey he gets lost easily and cries for someone to find him lol.I've continued to free feed him and he loves his scratch post will be getting him another one as he loves it so much. Will send some pics at the weekend struggling to get many good ones as he's so fast as soon as he see's me he wants fuss and tries to catch the camera strap haha. 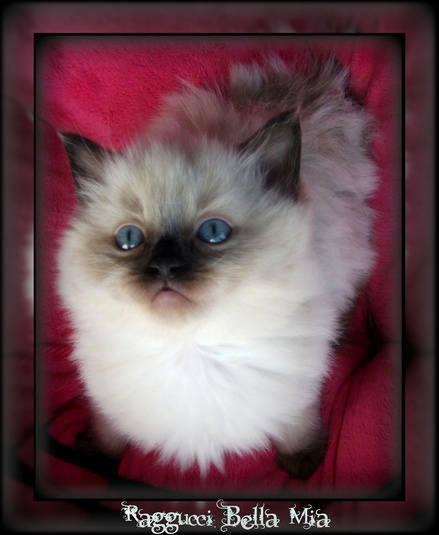 Thank you so much for such a fabulous Kitten he's already a big part of the family already. He seems to have grown loads. I have to get loads of treats, he has one before bed and before we go out. How are all your cats doing? Any new litters? We're all well. Beau is really settled in now, he's always talking! Lots of little growls when we talk back to him and he cries if we leave the room. He's getting ready for his first holiday, being looked after, when we visit centre parcs for 4 nights. Think i've got some photo's attached hope it works. Will have lots more in next few months. 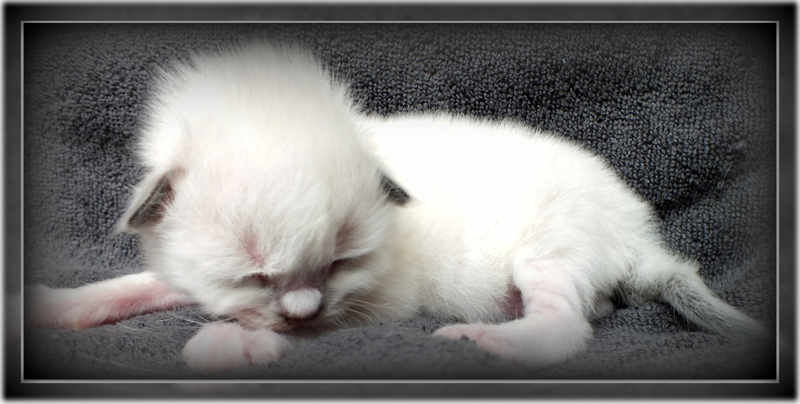 How are all your cats any new litters? 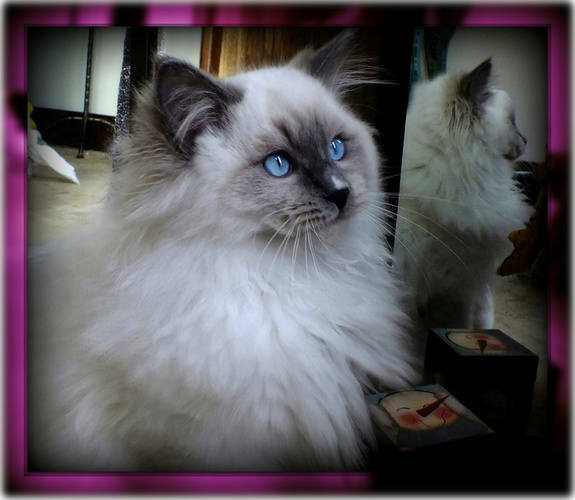 Must thank you again for such a beautiful well breed cat. I recently seen my friends Ragolls they didn't compare to Beau. Oh ps have booked him in for the chop!! Will be going next month so will send you all the paper work asp. hello sorry for the late reply been so busy with work, katie has started nursery and things are a little hectic. beau is doing very well hes become very sleepy but still goes mad sometimes. We recieved Beau's pink slip thank you. He's doing really well he became my daughters best friend now. I've got lots of lovely photo's will get some sent to you soon just so busy lately. He's looking great his blue points have gone a little darker and he loves to be groomed daily. Just thought id send a message just to let you know we back home, and she seems to be settling in well. She was crying quite a bit in the car so i took her out of the carry cart and gave her a cuddle and she seemed a bit timid but ok.
Then when we got her home she was just exploring about sniffing everything, she didnt hide like i thought she would do though. I gave her a bit of dry food and she eat quite a bit of that. She keeps meowing a bit coming over for a cuddle and she settles. We've been playing with the mouse on a stick and she loves that, she is just dozing off now on the top of the sofa, Purring away. She is so adorable! She surprised me how relaxed she is actually. I was just wondering, how many times do you normally feed her, and what times, just so she get fed when she has been used to. I'll leave the water and dry food out all the time as recommended but just need to know how many times and when she has the pouches? Yes she is completely settled in now rules the house lol. She's really confident now, she gets a little mischievous but in a funny way. She'll go into ultimate play mode when its about our bedtime and goes running from room to room pouncing on anything that moves, then of course when we get into bed its toe chasing time. Shes such a character and so loving, she was layed stretched out on her back with her paws in the air on Adams lap this afternoon. We had a few friends round last night and was a little concerned that she may be a bit scared with lots of people in the house but she just went from person to person just loving all the attention. We have attached a video clip for you. 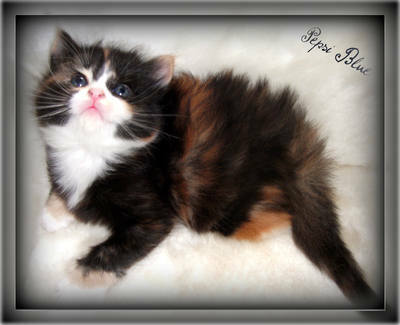 Hope your all well and all the other kittens are settling in their new homes. Thanks for the pics they are so cute. 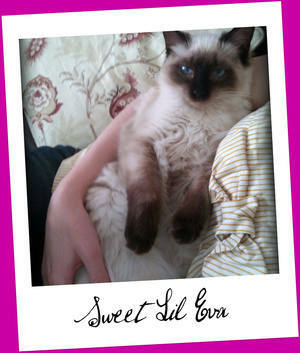 Yeah little Eva is getting along very well thanks, she is such a character. 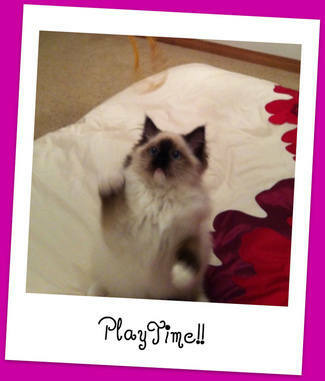 She is very feisty when its play time lol. It surprises me how she can go from one minute the floppiest thing cuddling up to you then all of a sudden she see's a piece of string or something and she goes mental. She still loves to attack feet also lol. She's had a couple of trips to the vets but it doesn't bother her, she's very confident, she just wants to explore everywhere she goes. She has had both her injections and also got her micro chipped just in case. We introduced her to Adams parents dog at the weekend, though i was a bit unsure how she'd react. She wasn't too bothered but the dog was terrified of her. It was pretty funny watching our tiny little kitten chasing the dog around the living room. Anyway, i'll send some recent pics of her soon as i bet she's grown alot since you last saw her, she seems to be getting bigger every week at the moment. Hope your all well, you'll have a new littler soon... April did you say they were due? Hope you and all the new arrivals are well. I'm just writing to ask your advice really. Well, me and Adam were thinking of getting a companion for little Eva, she loves to play so much and sometimes we're both out at work I feel bad for leaving her on her own. Its never more than a few hours really as I work shifts so Adams home with her a few hours after I leave. She sits and meows at the neighbors cat though the patio doors lol. What do you think about this? We're not sure how she would take to another cat in her territory now though as she's used to being on her own. 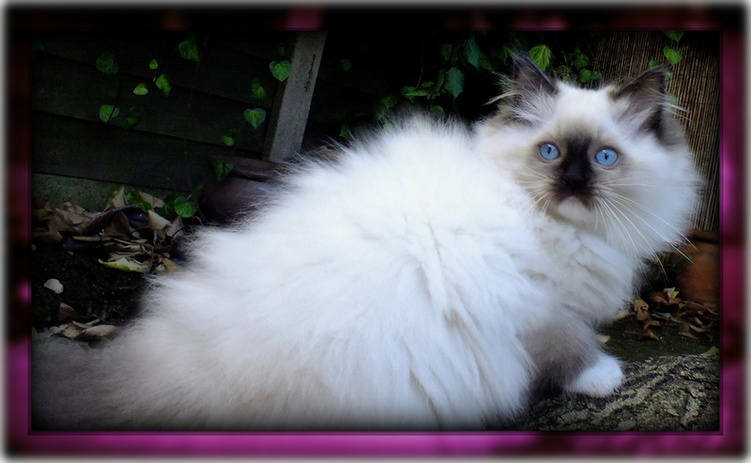 Do you think we should leave it until she is a bit older or are Ragdolls generally ok with other pets? 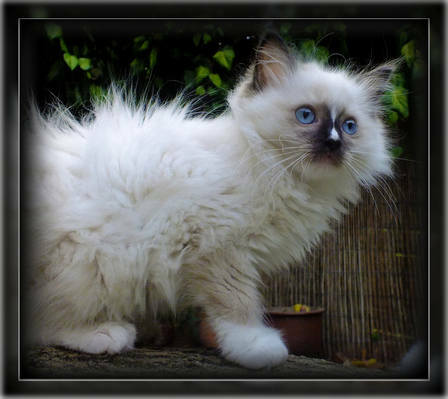 We would of course like another Ragdoll, we have completely fell for the breed and so have our friends and family. Also would she get on better with another female or would you recommend a male? We'd be happy with either tbh. 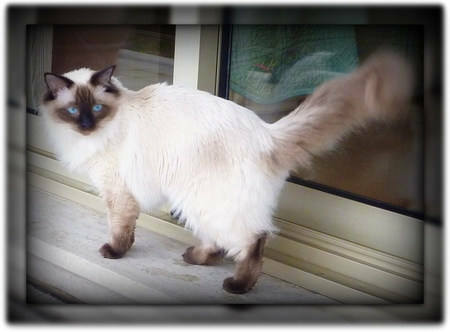 We were thinking about it and we would love a Colour point mitted male for a companion for Eva. 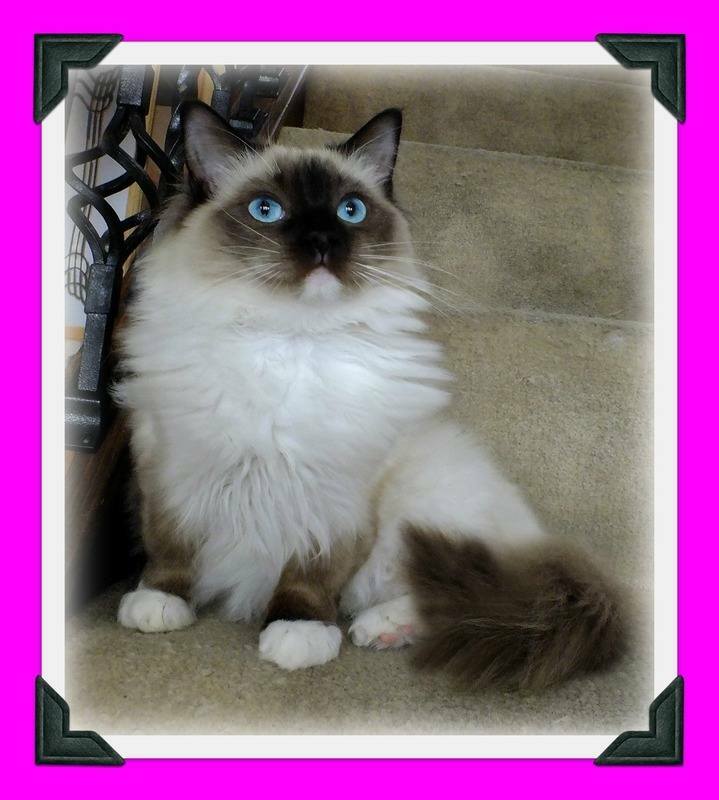 We love Eva's colouring she is stunning, so we would like one similar but with something distinguishable so a mitted would be lovely. So if you could keep us updated that would be great. Yeah we are all well thank you. Eva went for her operation last Thursday. We got the form back yesterday so will post it to you this afternoon. She was absolutley fine, thought she'd be groggy for a day or two but picked her up and she was running about again within a couple of hours. She has a big bold patch tho lol. Good news about Coco, yeah if you could let us know that would be great. 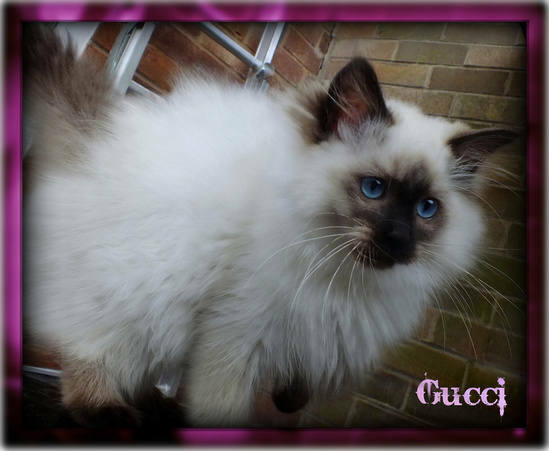 Thats good, they were sent later than I originally said, but glad you got them ok.
We definitely would like the seal point mitted boy if thats ok? What would you like us to do? We are away next week on holiday and I'm guessing there still a bit young for visiters yet, so we could post you a cheque for the deposit and pop round when we get back, or when they are old enough to view. Yeah Eva is much lighter now than she was, her colouring is beautiful. 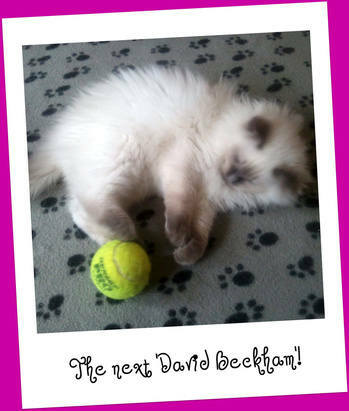 We are looking forward to seeing him, he's going to be so tiny compared to Eva now. I just hope she motheres him and doesn't decide and bully him like she did the dog lol. I was wondering would it be ok for them to share the litter tray? Its just we have an enclosed self cleaning one that is really big but I wanst sure if they need there own? I'll get him his own bed and everything else. Just a quick email to see how our little boy is doing? We're still stuck for names but i'm sure we'll think of one soon. Would there be any chance of seeing him within the next few weeks? Eva is doing fine, we have just bought her a massive play den with scratching posts and dangly bits on it so thats keeping her well entertained. Its pretty tall too so she loves climbing up sitting right on the top. Yeah Eva is doing well, eating us out of house and home at the moment, think she is having a growth spirt. I think she'll love having someone to play with, sooo looking forward to it. Though we may have moved house by that time hopefully. Thank you very much for the pictures, I love them, he looks so adorable! He looks so grown up. 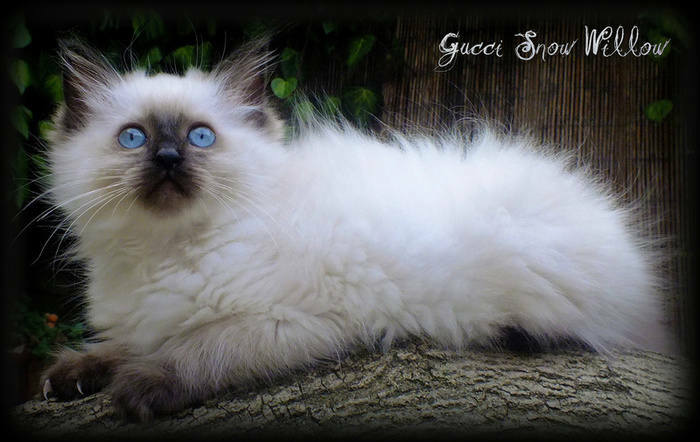 Would it be possible to pick him up next Monday? We get the keys to our house on Friday so that gives us plenty of time to move all our stuff in, should be done by end of the weekend. I will let you know a time in the next couple of days, when I find out my shift at work. But will probably be in the evening if thats ok with you. So excited about bringing him home. Hi jo, iv sent a few pics and videos of eva. Can't remember if I sent these ones or not. 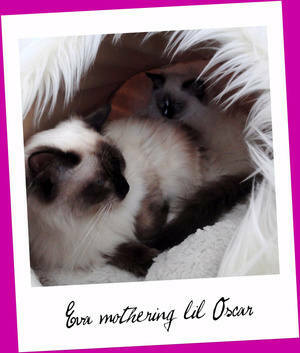 I will definatley get lots of pics of Oscar and Eva together. Hopefully they will get along very well and I'm hoping Eva will mother him. Eva is extremely loving at the moment too. As soon as I sit down she is on my lap snuggling up, and following me round all day. I should get my rota later today so ill let u know as soon as possible what time on Monday. Gone to live with Claire, Adam & big sister... Eva. 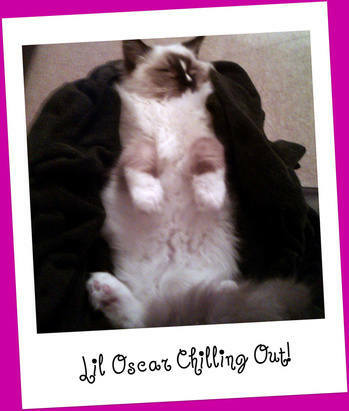 Just a quick one to let u know Oscar is absolutely fine. He's not timid at all, just been playing with all his toys. He loves the tassle thing with the stars on. As soon as he spotted Eva's dinner he ate the entire lot. Now we've just put him some down in our room for the night and he gobbled most of that too lol. He has been trumping every couple of minutes too which is lovely haha! Eva is a bit unsure at the moment. Just deep meows and arched back. She was ok whilst sitting on my lap and watching him, but if he comes right up she starts hissing. Oscars not bothered by her though, she hisses and he just walks on by unfased. Sorry I havnt been in touch before now. It's just in the new house we don't get internet until a week on wednesday so I have to use my phone which I hate using for internet its so slow. 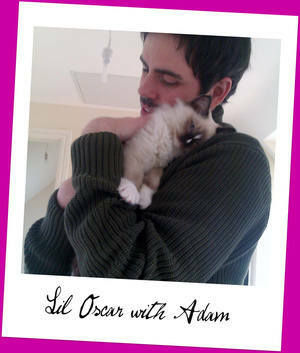 Anyway yeah Oscar has settled in really well, him and Eva are napping on me as I write this. ( I just took a photo and attached it) They are best of friends now after Eva was a bit hissy for the first few days. She washes him, sleep together and they like to have a bit of a play fight in their daily mad half hours lol. 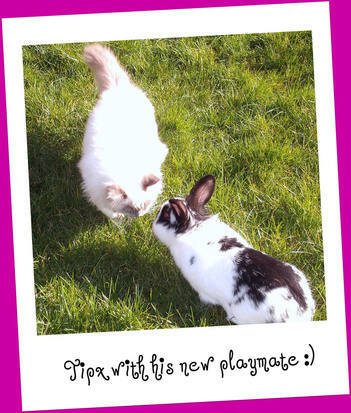 It's really nice for Eva to have someone to play with even tho he is a bit more playfull than her at the moment. I give him a little bit of meat twice a day now and he has the dry mix the rest if the day. He's so funny, im pretty sure he would eat continusly all day if I let him. Eva has always nibbled her food all day just having little bits but with Oscar he will gobble all his dinner as fast as he can, lick the bowl clean then go searching for more. I have to keep them seperate at dinner times as Eva would never get any. 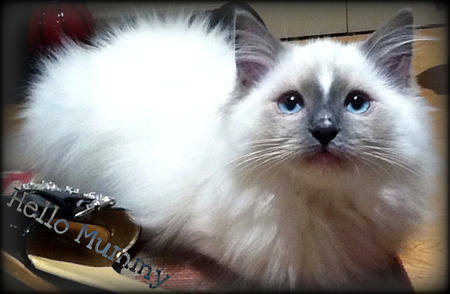 He is a lovely kitten and loves to be picked up and carried everywhere. Although the other day I was cooking the dinner and he was on the floor looking up at me going "pick me up now" and I had my hands full with pots and things, I gave him a little fuss then tuned my back on him. Then he was like "how dare u ignore me" and actually climbed up the back of my legs like a monkey! Adam found it hilarious. Anyway ill try and attach some pics from my phone and a video I took on Saturday if it will let me. 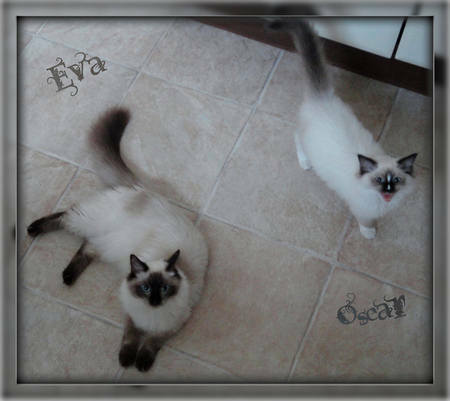 Thought i'd send you a few pics we have of Oscar and Eva. I'll try and send that video too of the first meeting. I'll have to send that one separate though. is always him starting the fights lol. 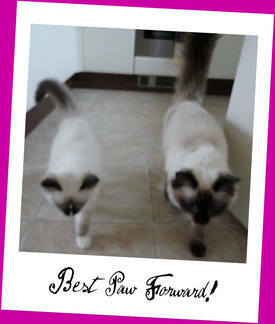 Anyways, I hope you enjoy the pics, I especially like the one where they are both walking forward with the same paw. I sent a few pics and a video of Oscar being cleaned by Eva... I think it sent ok. I tried to send that one of there meeting but I think it was a bit long. I might try and cut it down if not i'll stick it on youtube or something and send you the link. 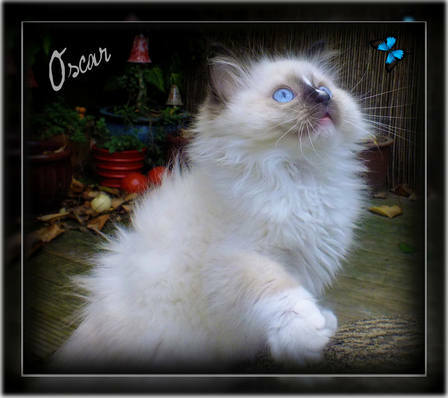 Oscar is doing very well, he went for his operation last Thursday and recovered in a matter of hours. He was running round bugging Eva again in no time lol. chill out all day and he just wants to play constantly, but I'm sure he'll grow out of that. Yes he still loves being carried about. He likes nuzzling his head under my chin too when I pick him up...its so cute. He also walks around all day chattering to himself its so funny. Its like a purr he does, it sounds like a phone ringing. Anyway i'll send you the contract some point this week. Thank you so much for the lovely xmas cards. Hope you all had a great day. Thanks for the birthday wishes for Eva. She's had a poorly eye over the weekend bless her. I got up one morning and noticed her eye was all weepy' so I just cleaned it with warm water and hoped it was just a hair or something, later that night it had all swollen up and gone all red. So I took her to the vets first thing the next morning and found it was a scratch down the middle of her eye. Seems Oscar was the culprit whilst playfighting :) I got some antibiotic drops tho and it was better within a couple days. He's can't leave her alone, lol. Oscar is extremely playful and dives on her to play fight but she doesn't always want to play, I think she gets a bit annoyed with him. He's still ridiculously adorable though' and getting bigger by the day! He's so heavy compared to Eva now and so fluffy. Anyway I hope you are feeling better, its seems everyone has either had a stomach bug or a cold this xmas time. Gone To Live With... Jackie & Jem. 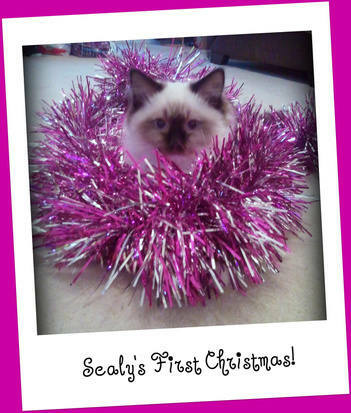 Well Sealy as settled in just great! He his already master of the house, even over the dog :) His antics are so cute and he his into everything! He is now climbing all over the keyboard as I am typing, LOL. I have passed on all your love and kisses. 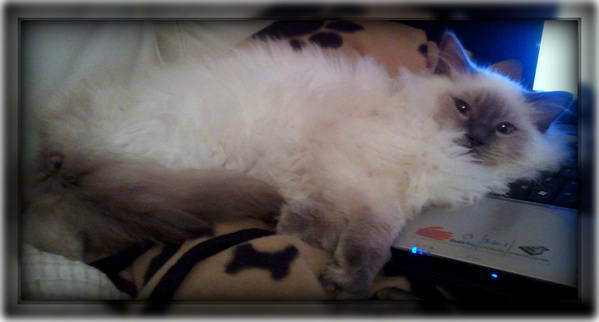 Hi Jo, Just to let you know Sealy has now totally took over the house. 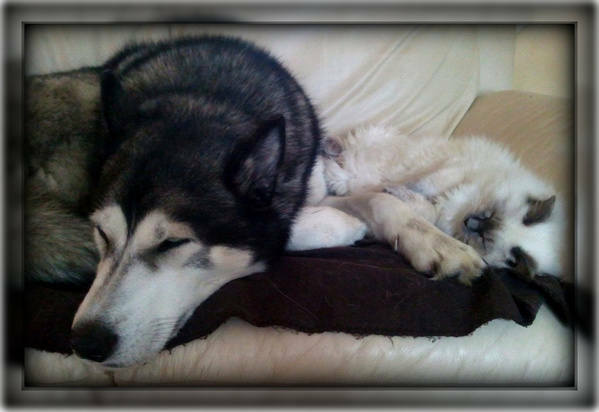 His best mate is our husky dog.. although he plays to hard, Sealy that is lol. He is into everything and very mischievous, but just so very funny! He is growing so fast and I am sure he will be like his big brother Romeo, very soon. 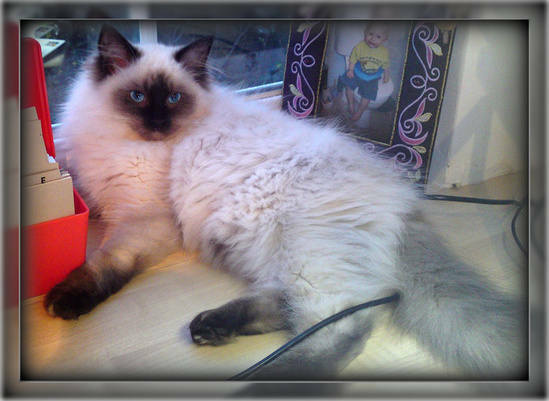 Here are some pictures that show that butter wouldn't melt in his mouth but don't be fooled he is now the ALPHA male of the house lol. 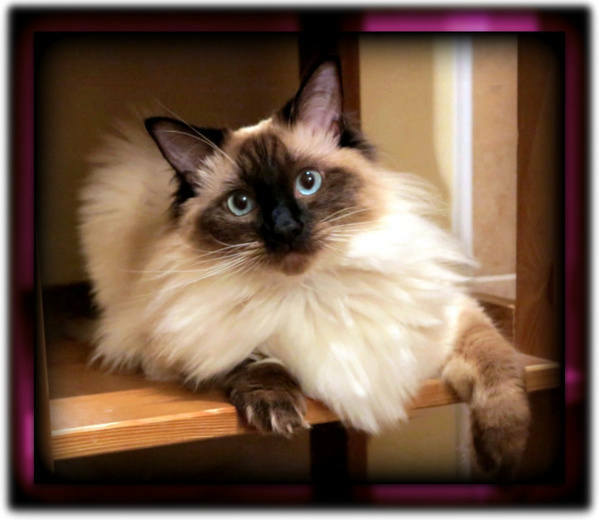 Sealy as been neutered and doing very well. We are going on holiday in April to Torquay and would be really pleased if you could look after him for us while were away. It would be nice to know we can leave him with you. We have arrived safely at our new home! We have been doing lots of exploring and playing with the lovely toys you gave us in our goody bag! We have been eating our dry food and have just had our milk. We are so tired after a long day we have fallen fast asleep on the sofa. We will email you again in the week when we have spoken to our new vet. Hi Jo- Hope you are well!! They’re so gorgeous we are so pleased with them!! 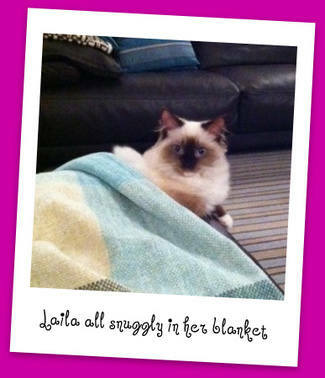 Another question for you…Biggles, the older ragdoll isn’t too happy that we have new arrivals! Its not the end of the world as he lives next door with Ashleys parents, so they do not need to ever come into contact, but it would be so much easier if they all got on! Then we could have them together when Ashleys parents go on holiday, and have them go between the two houses. Do you have any advice on how to stop him being so territorial and accept them? We were very surprised when he saw them and hissed!! The boys are doing very well. 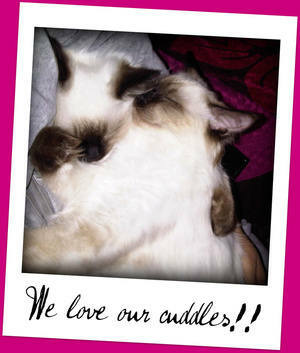 They really are the best of friends, always sleep next to each other, groom each other and it is so cute when the cuddle!! Sometimes when they sleep they have their arms around each other! They are having great fun playing with each other and they still love to wrestle! They have both grown so much! They are now both eating us out of house and home!! They still love their whiskas treats and their milk. Piccolo has become very affectionate and constantly has to be on my lap or on my shoulder! Its very bizarre but he likes to think he is a parrot and is very good at keeping my neck warm! 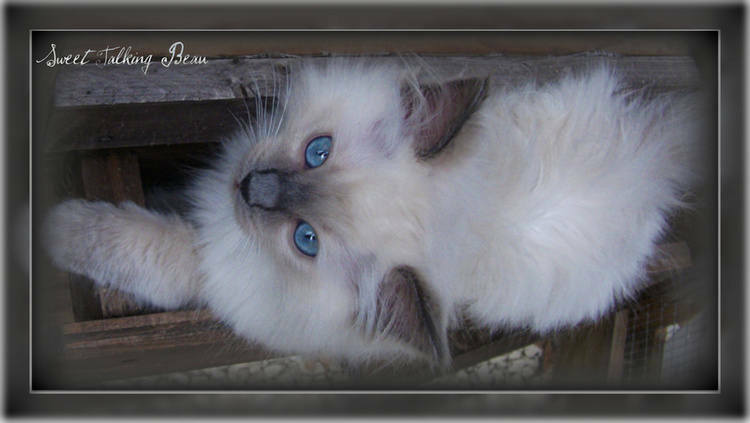 He has developed the most striking blue eyes and his colouring is really showing in his tail now and around his ears. 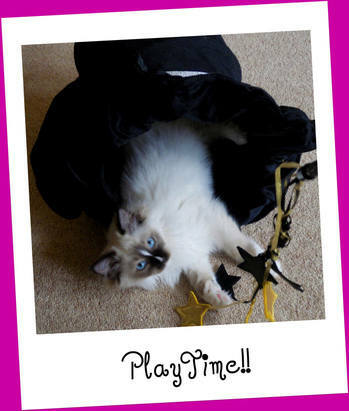 He is the crazy cat and charges around the room and has a habit of chasing shadows on the floor?! ?He also likes to climb and I recently had to get him down after climbing 5 foot up the curtains!! Strangely Hendrix who used to be the crazy cat has calmed down a lot. He sleeps a lot now and isn’t as hyperactive as piccolo. He still likes to play with his toys and wrestle though! He likes to sleep next to us and is definitely a Daddy’s cat, as he doesn’t leave Ashley’s side when he gets in from work. I have spoken to the vet about neutering. We want to make sure that we get them done before they start spraying. 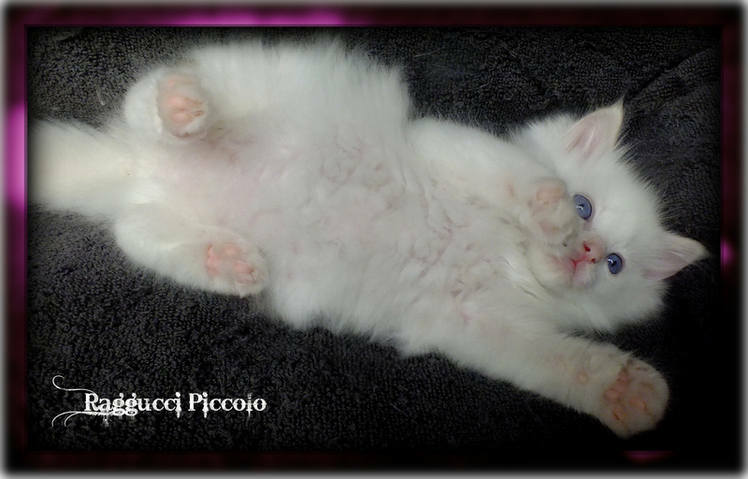 We will probably look at either getting Hendrix done at the beginning of December and piccolo the beginning of January or getting them both done at the same time around Christmas. The Vet said she could microchip them at the same time as neutering. We have been slowly introducing them to biggles, he had a bit of a hiss at them, and didn’t show any interest and kept leaving the room to sulk for a while. The only aggression he has shown is hissing but after a while he gets bored and usually walks away. Progress is very slow but I’m hoping he will accept them soon. Ihope you are well. Sorry I've not been in touch for a while- Ashley has been very ill and was In hospital all over Christmas. He is still on the mend, but getting better every day! They have both grown so big! (Hendrix In particular, with him being older) I have sent you photographs and letters from the vet. I hope your cats and kittens are all well. I took the kitties outside for a little while and surprised them! They loved it looking around the garden, but still stayed close as they were unsure! Maybe in the summer they will be out a bit more.